You would’ve had to have spent the last couple of years in a coma if you’d failed notice the rapid rise of Coworking Spaces. Ongoing development of technology and the good old internet have enabled the proliferation of countless new-age independent professionals, solopreneurs, startups and small businesses, so it really is no surprise that Coworking Spaces and Shared Offices are So Hot Right Now (unlike Hansel in Zoolander 2 – which is a completely awful movie, and believe you me, it really pains me to share this useless random fact with you). 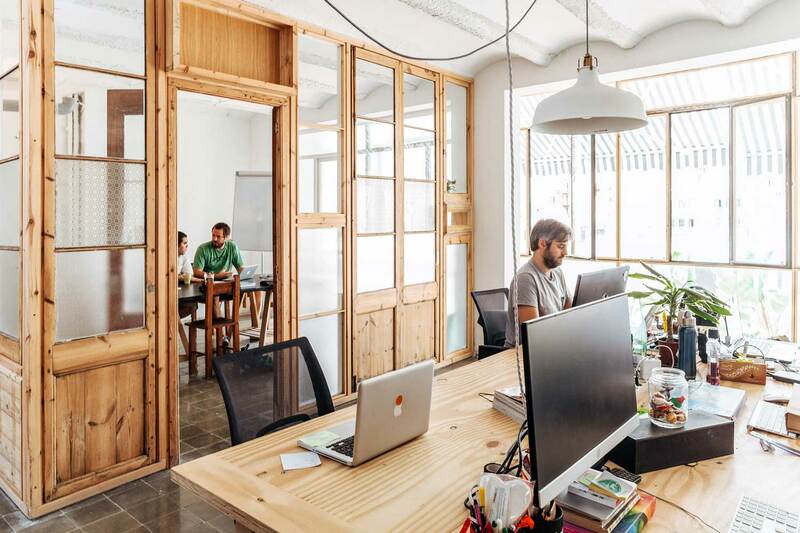 I’m sure that many of you would’ve seen a few examples of Coworking Offices in your own travels – perhaps you even work in one yourself…? I don’t know about you, but what strikes me the most about many of these spaces is how terrible they are. Overly sterile or just trying really hard to be different, socially stimulating and “funky” (my favourite word to describe an interior – not!). 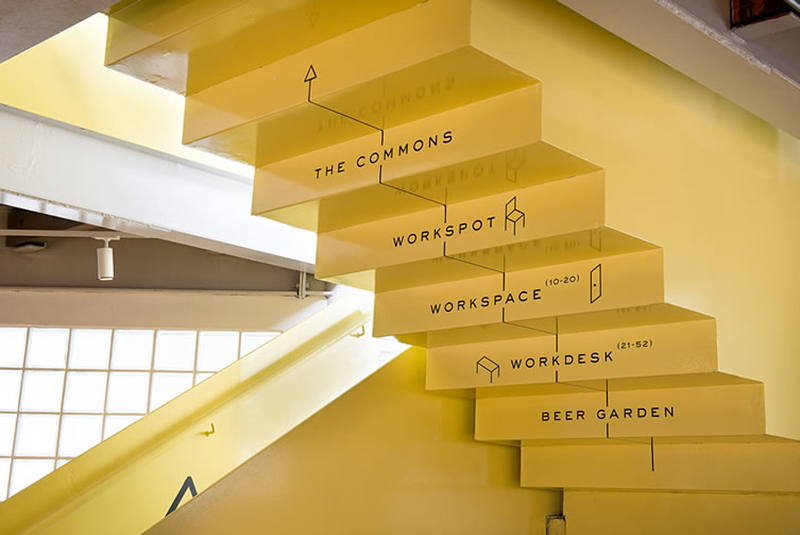 The problem with so many Coworking Spaces and regular Commercial Office Spaces for that matter, is they often cram too many ideas in a single space to the point they make me want to gag (a personal pain point of mine, btw). To make matters worse, budgets on these type of projects are often super low, making it trickier to create something that sings. But anyway! We are not here to talk about bad design – hell no! We are here to celebrate the good, the groundbreaking, the interesting and the innovative. 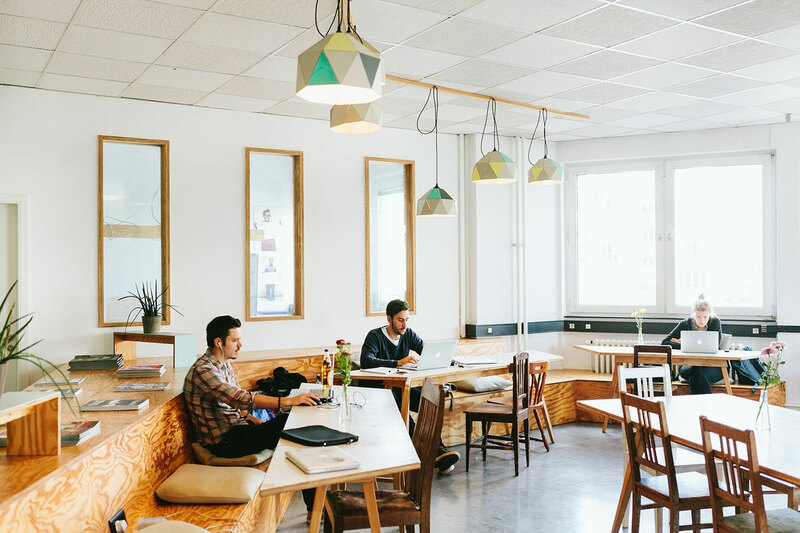 So without further ado, here’s (another) epic roundup of amazing Coworking Spaces from around the world to suit all tastes and budgets – from noisy and basic, to flashy business lounge-style offices. No worries, you’re totally welcome. 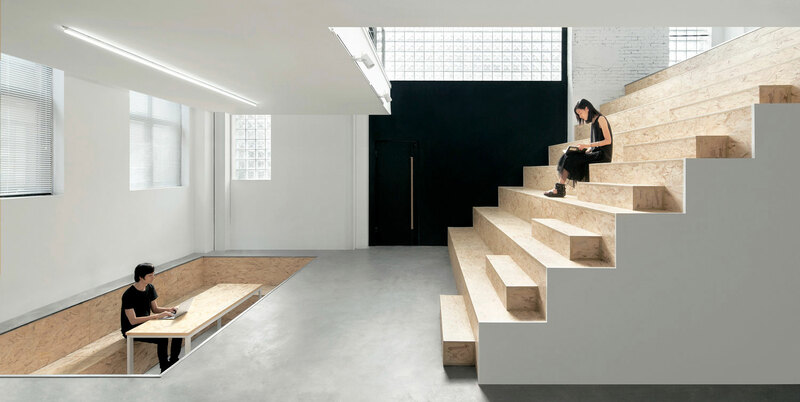 Stock share office by Salt Design in Tokyo // Ogata Yoshiki/ SALT and Watase Ikuma teamed up to transform a warehouse in Tokyo into Stock shared offices. The existing building had a five-story container architecture style, surrounded by metal, with low ceilings and no windows. This gave the space a very inorganic feeling that the architects wanted to eliminate. Since the property exists in the middle of a hill and had no defining landmark, they planted a 12m tall sequoia tree to create a distinctive feature along the street. 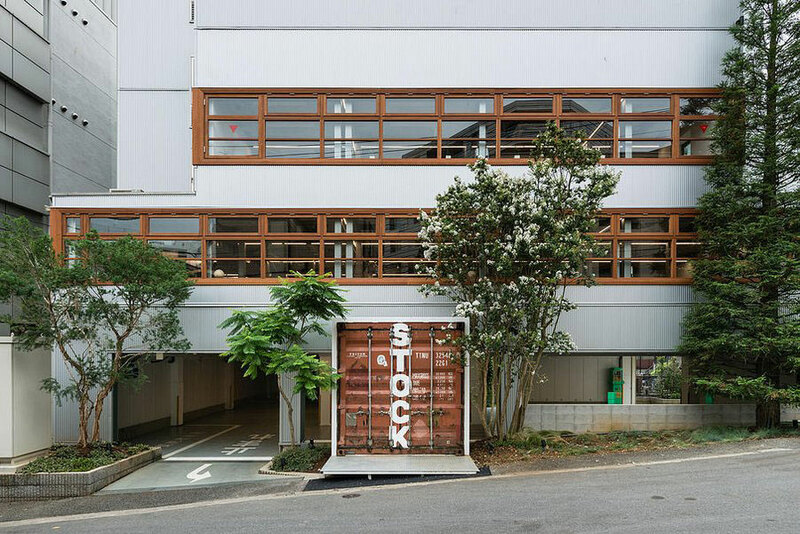 A ten-year-old marine container has been appropriated to act as the entrance door. 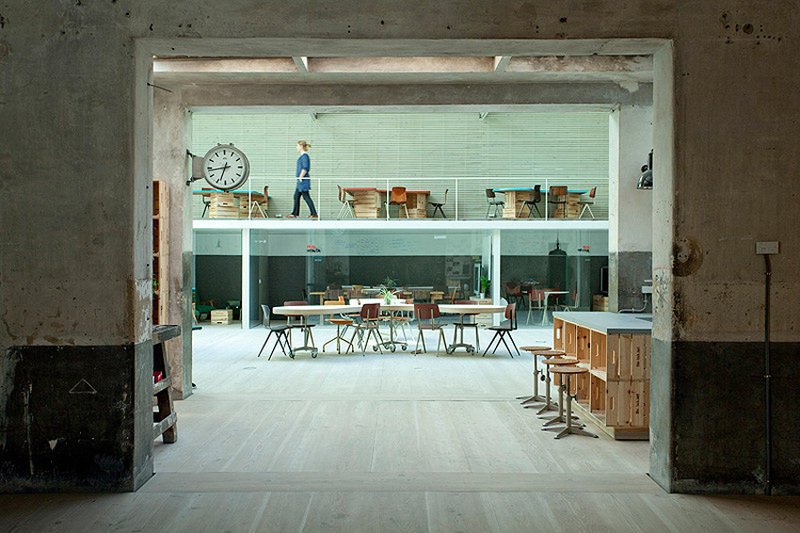 A ten-meter long kitchen is arranged towards the big open concept space as well as a variety of furniture intends to correspond to the user’s moods, events, or work activities: when combined, the benches can become a hearth; and when piled, the stools become shelves. 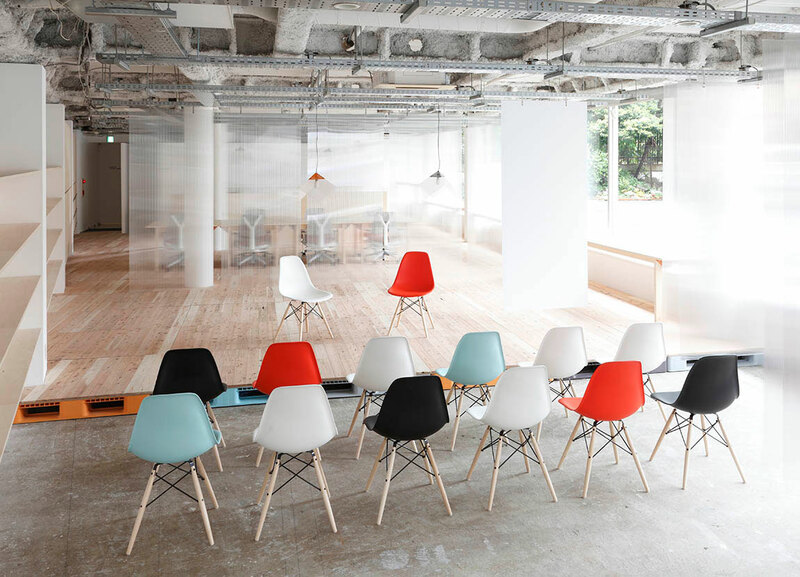 There are no more than three pieces of furniture that are the same, giving users the chance to customise their work environment every day. 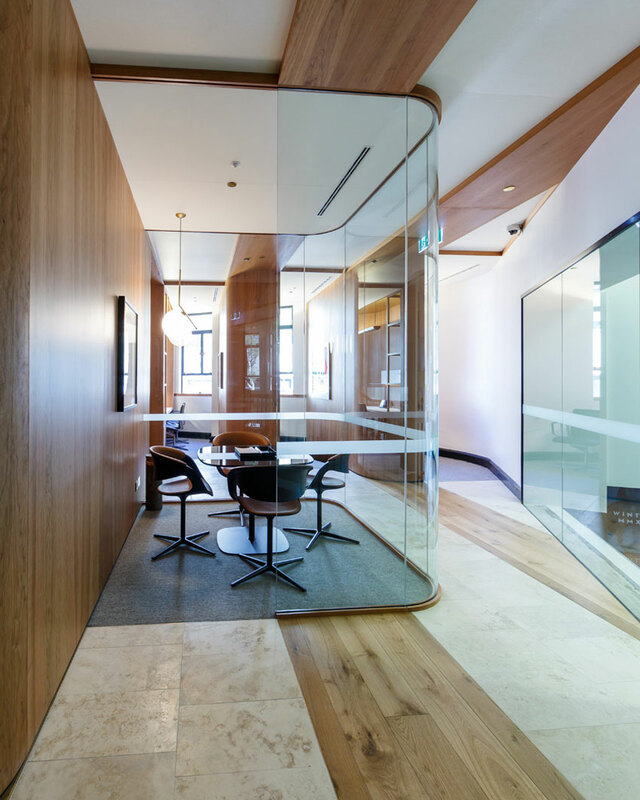 The Porter, Haworth’s Executive Club Lounge in Sydney designed by Gensler // Reinventing the way we do business, The Porter is a space somewhere between a private members lounge and a five star business centre, complete with concierge. 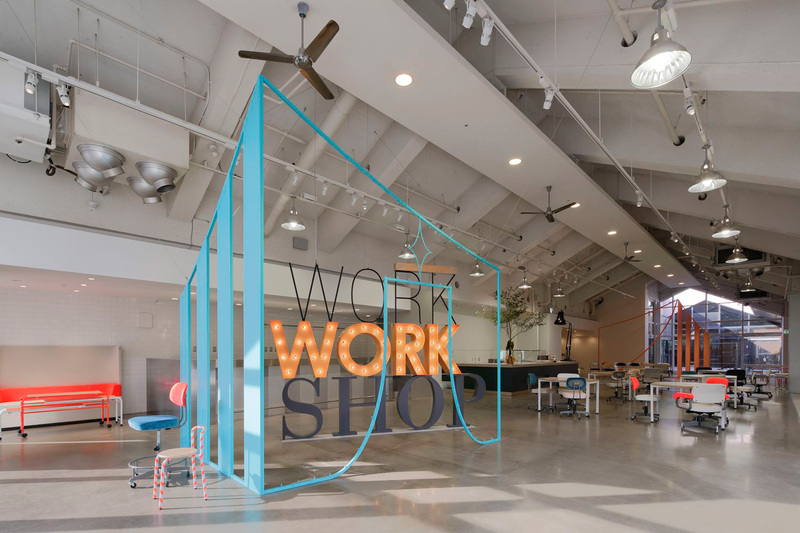 This activated, curated space provides its members with the tools and environments for high quality collaborative experiences. 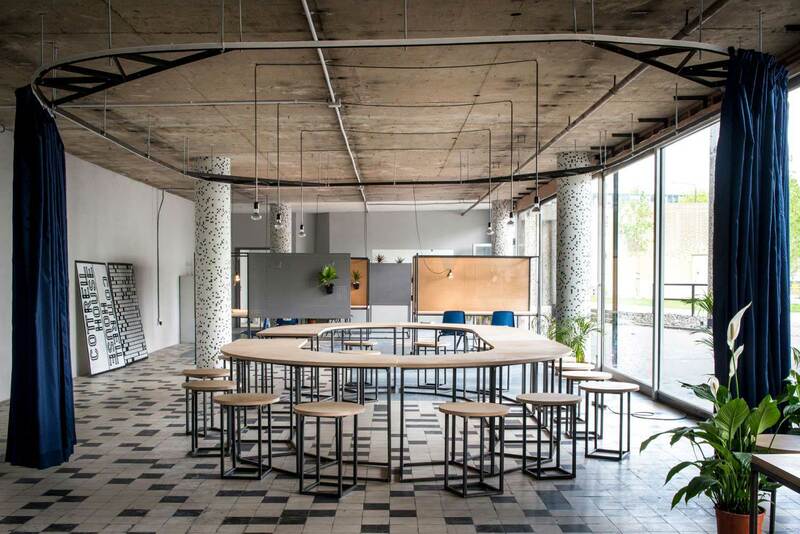 Featuring communal tables with interactive projectors, movable furniture and writable wall surfaces, this space facilitates energetic workshop-style working and activities with an executional emphasis. 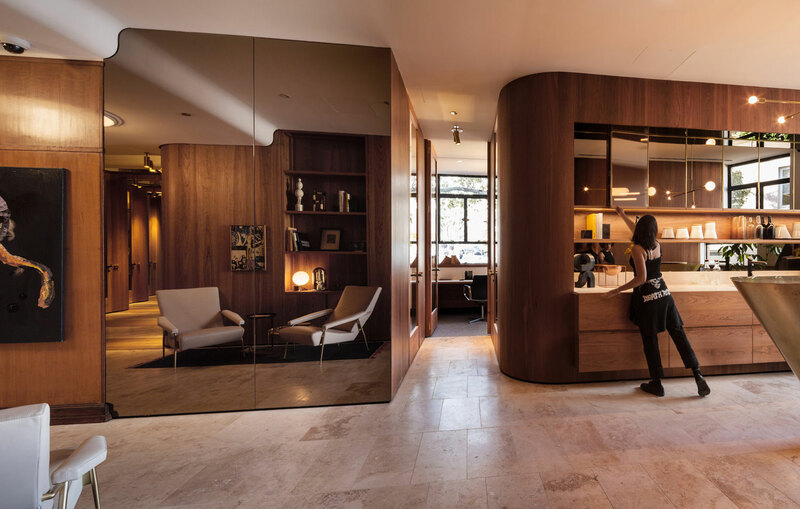 Images courtesy of Soho House. 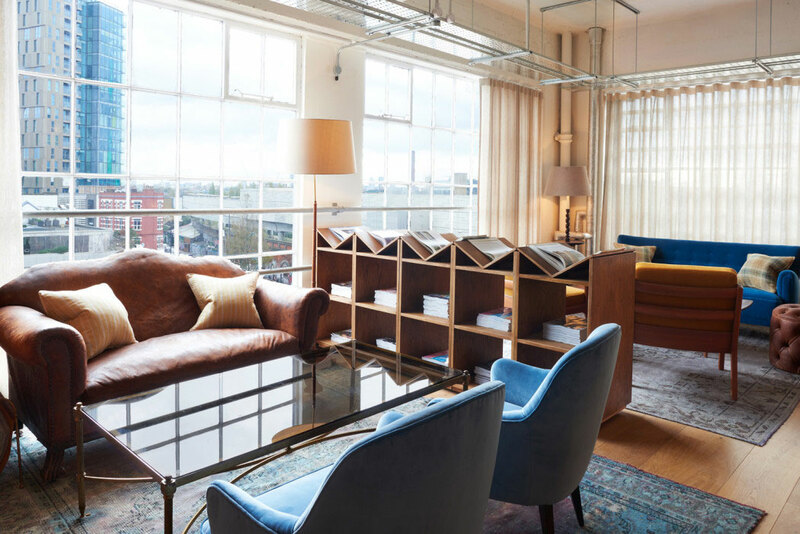 ‘Soho Works’ workspace by Soho House in Shoreditch, London // Set in East London’s iconic Tea Building, Soho House & Co have recently launched SOHO WORKS Shoreditch; the first of an international network of 24/7 workspaces designed for creative industries. 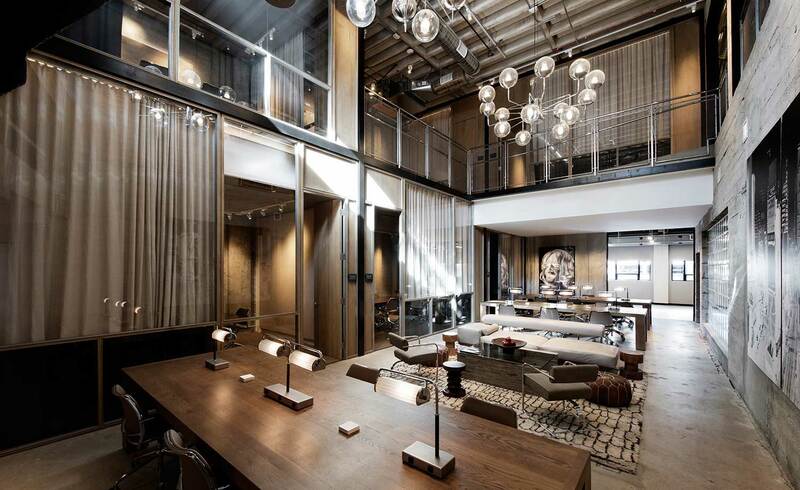 The 1,500 sqm layout, which hosts 23 private studies each accommodating one to 10 people, feature vintage and contemporary furnishings, including 19th century Victorian dining rooms tables and brass mid-century chandeliers which sit beside bespoke Humanscale ergonomic furniture. Related Post: Tour of Soho House(s) Around the World. Images courtesy of Rockwell Group. 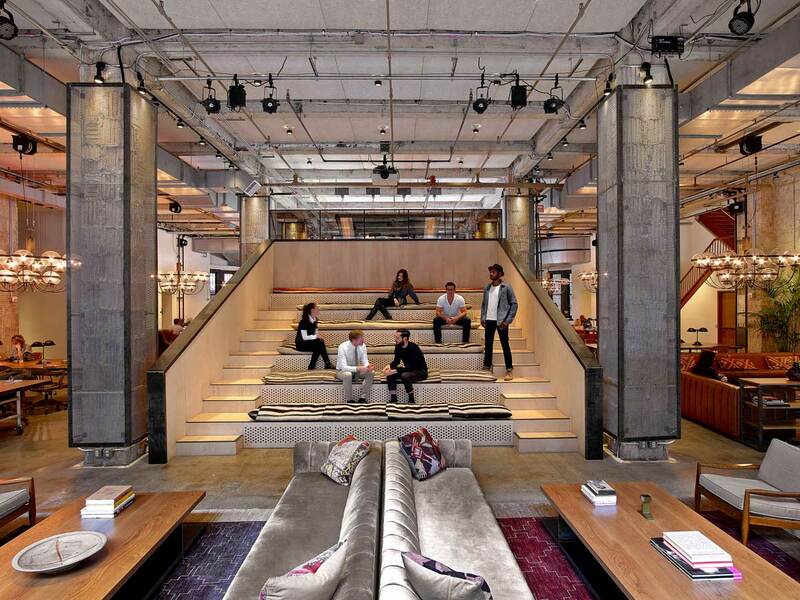 ‘NeueHouse’ Co-Working Offices in New York City by Rockwell Group in collaboration with NeueHouse Studio // NeueHouse is a shared work space concept designed for entrepreneurs in high growth, creative industries including design, tech, fashion, entertainment, publishing, art, and communications. 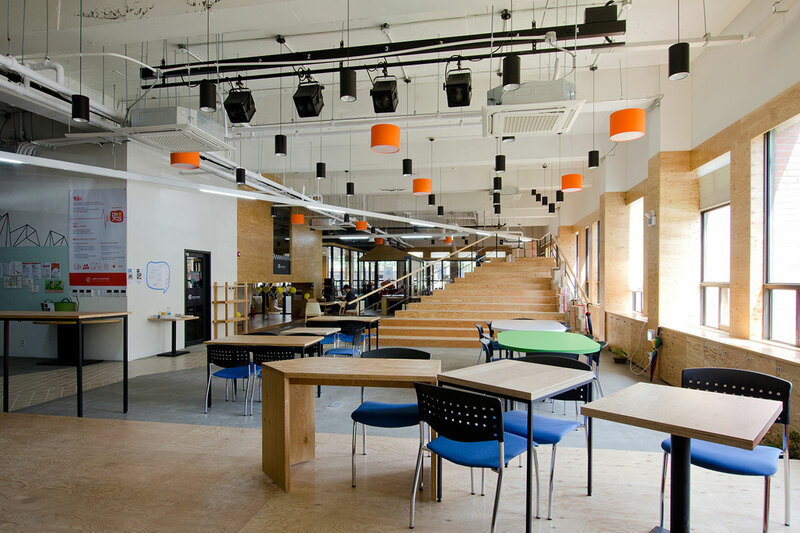 Based on successful hospitality models, the open, flexible facility is designed to enable members to collaborate with their own teams or with other entrepreneurs. 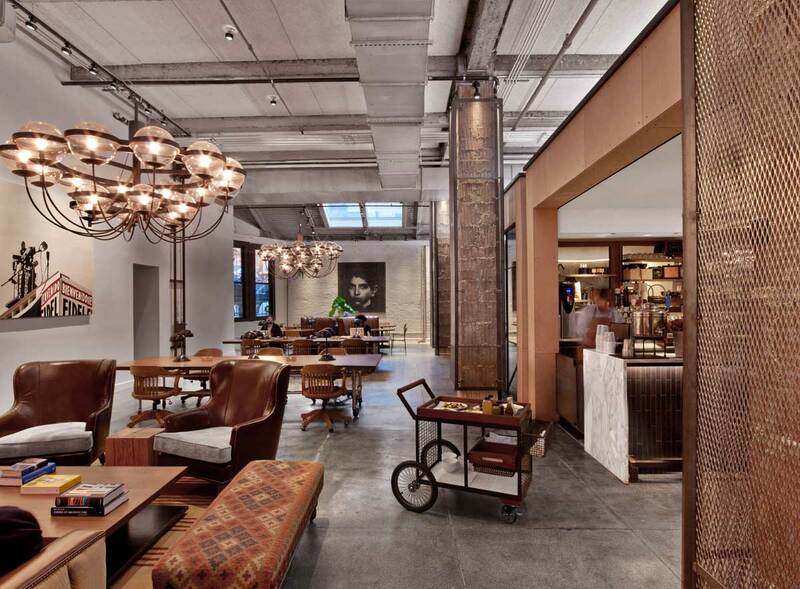 NeueHouse occupies five floors of a century-old building originally designed for light manufacturing industries that later served as the location for Tepper Galleries, a well-known Manhattan auction house. 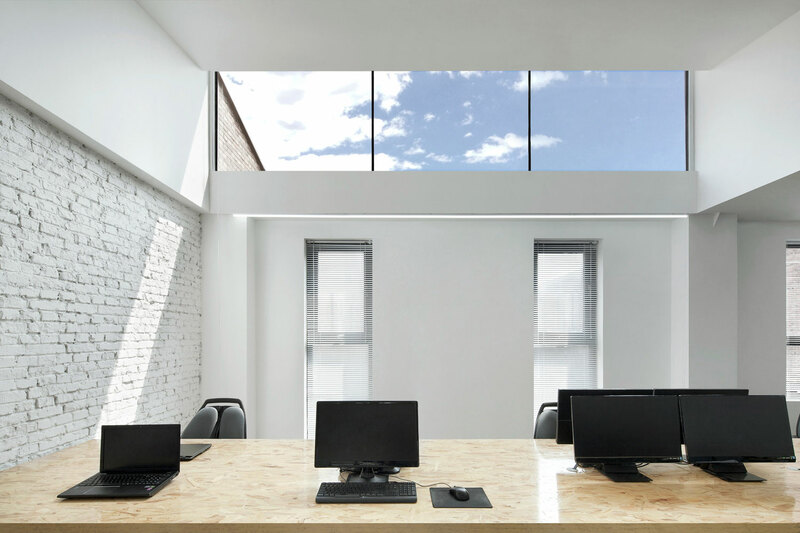 The space includes a cellar level, ground floor and three upper levels of dedicated office space. Inspired by its creative members, NeueHouse hosts a rotating, curated collection of artwork by emerging international artists. 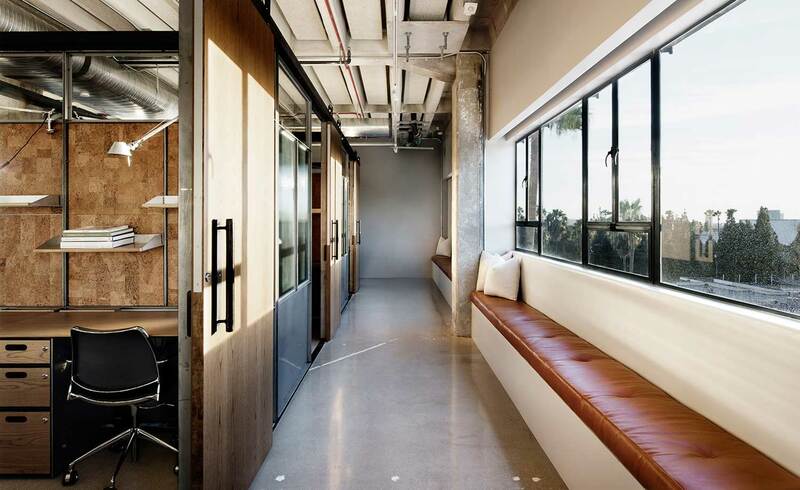 NeueHouse in Hollywood, LA by Rockwell Group in collaboration with NeueHouse Studio // The second NeueHouse in Hollywood, opened in Los Angeles in October 2015. 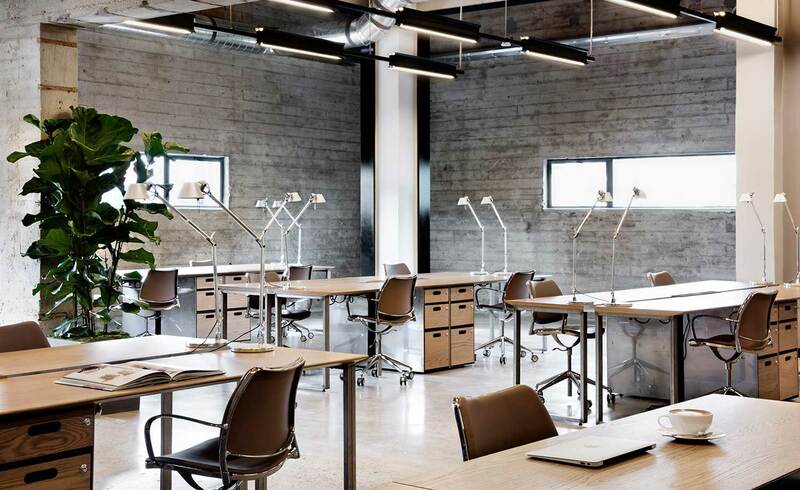 Armed with elegant interiors courtesy of Rockwell Group and NeueHouse Studio, custom-designed office furniture, an in-house restaurant, broadcasting studio and a host of special programming, the community-oriented workspace seems more like a member’s club than an office. 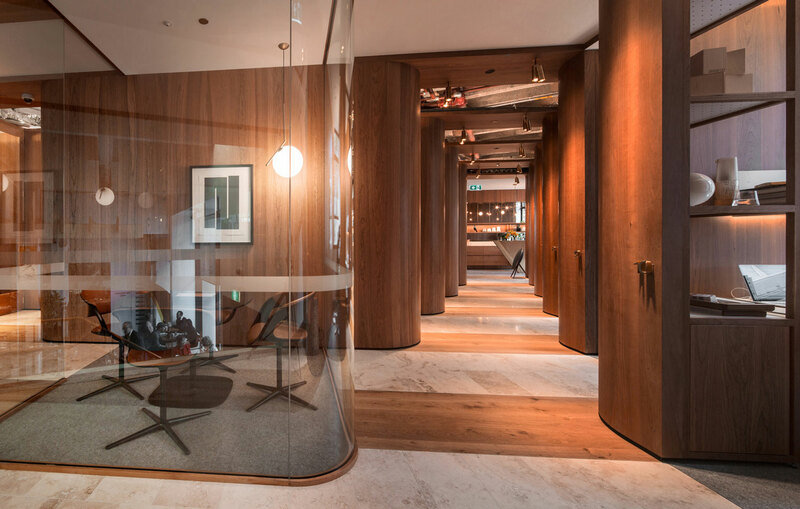 The formula proved so successful that for its second location, NeueHouse chose a six-storey building, almost double the size of its Manhattan original. An icon in itself, the 1938 landmarked building was previously home to CBS’ radio and television studios until 2007 and designed in the international style by William Lescaze, a Swiss-born architect. 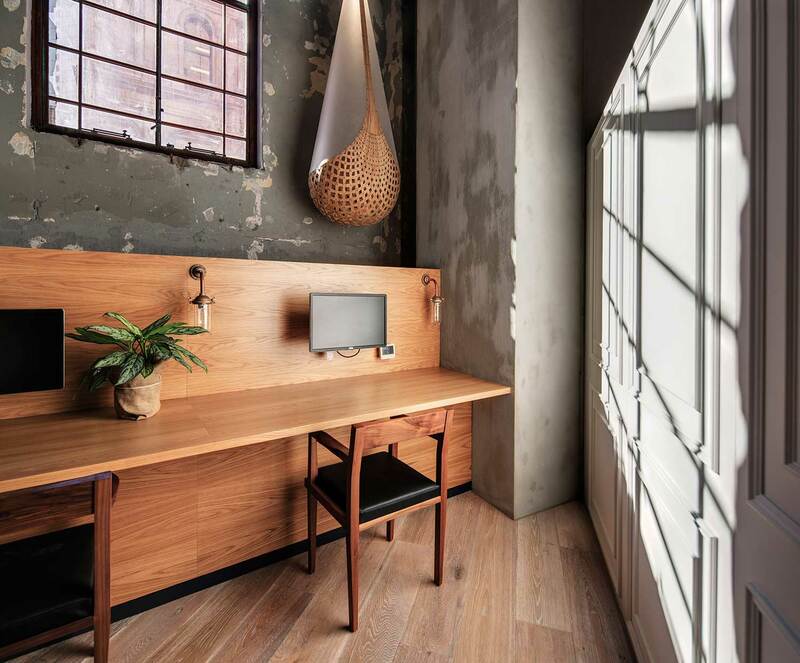 Paramount by Office Space in Surry Hills, Sydney, designed by Woods Bagot // Paramount by The Office Space launched in late 2015. 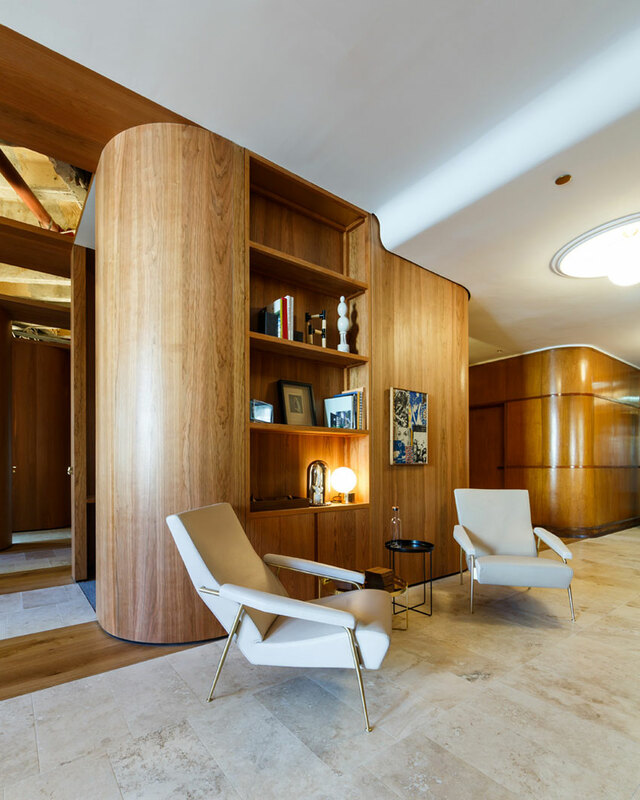 Housed in the iconic Art Deco Paramount House (once the Australian headquarters for Paramount Pictures), it is The Office Space Group’s more sophisticated offering. 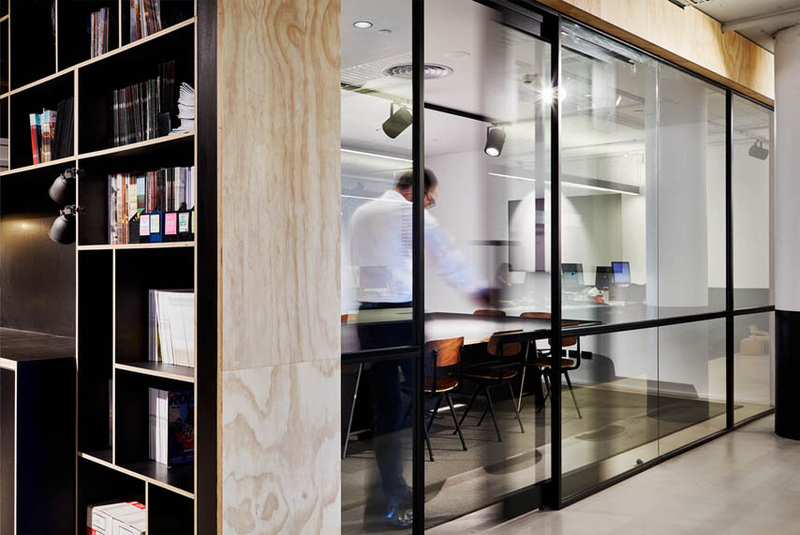 Recognising the need for a more prestigious share office environment, it has delivered an unprecedented model that the Australian market has not, until now, managed to conceive. Channeling a particular period of glamorous high-end corporate office design reminiscent of New York in the ‘50’s, the warmth of the burnished brass fixtures and natural materials including wood and limestone plus accents of leather, marble and ceramics provide a refined and elegant palette. 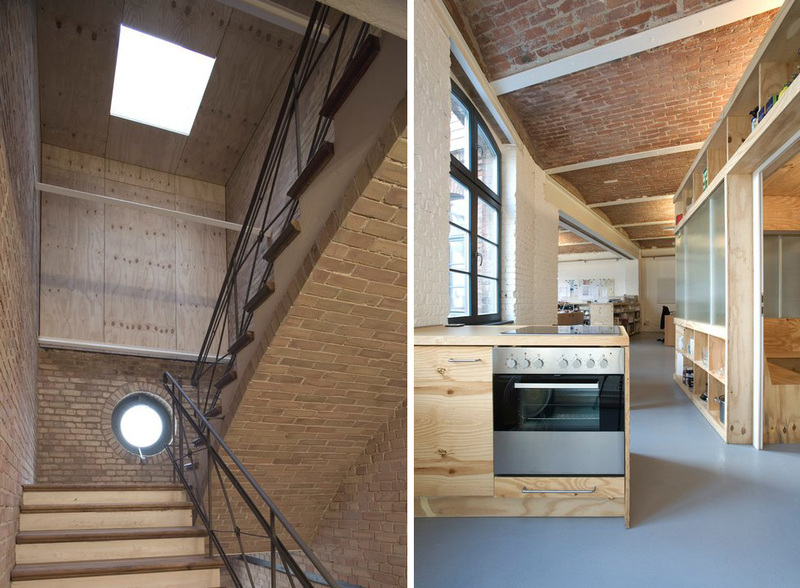 ‘Halle A’ Creative Studio Space by Designliga in Munich, Germany // Before it’s conversion by Munich design agency Designliga, Halle A was a metal workshop for a utilities company Stadtwerke München. 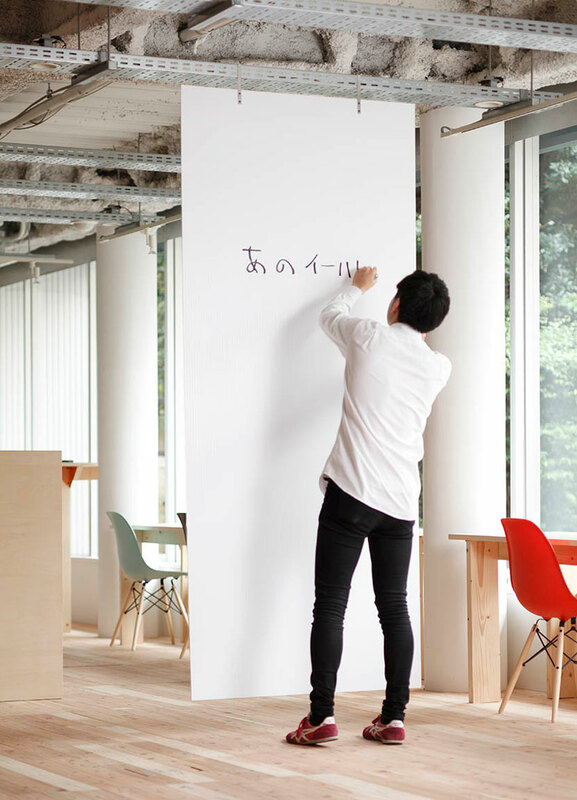 Today, the studio is shared by Designliga and web company Form & Code. 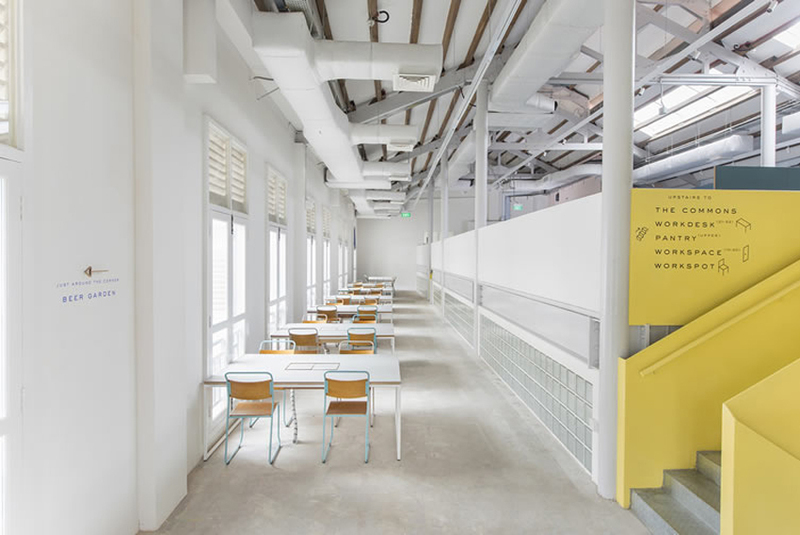 The designers made a considerable effort to preserve the original character of the hall – the atmosphere of the new studio builds on the industrial atmosphere of the space, with exterior features referenced throughout the interior. 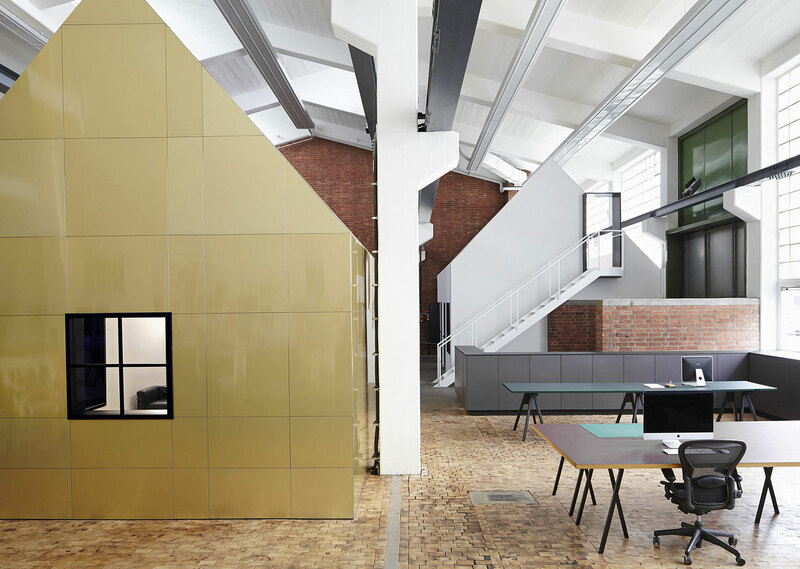 The colour palette is based on the materials and textures prevalent in the complex, whilst the exposed bricks throughout the space have been left untouched. Please save me a couple of desks guys. 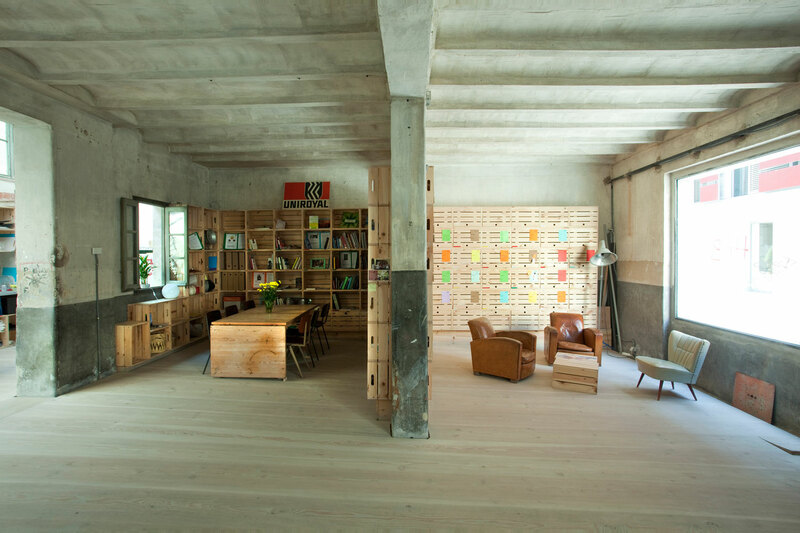 Yellowtrace HQ is moving to Munich. Too good! 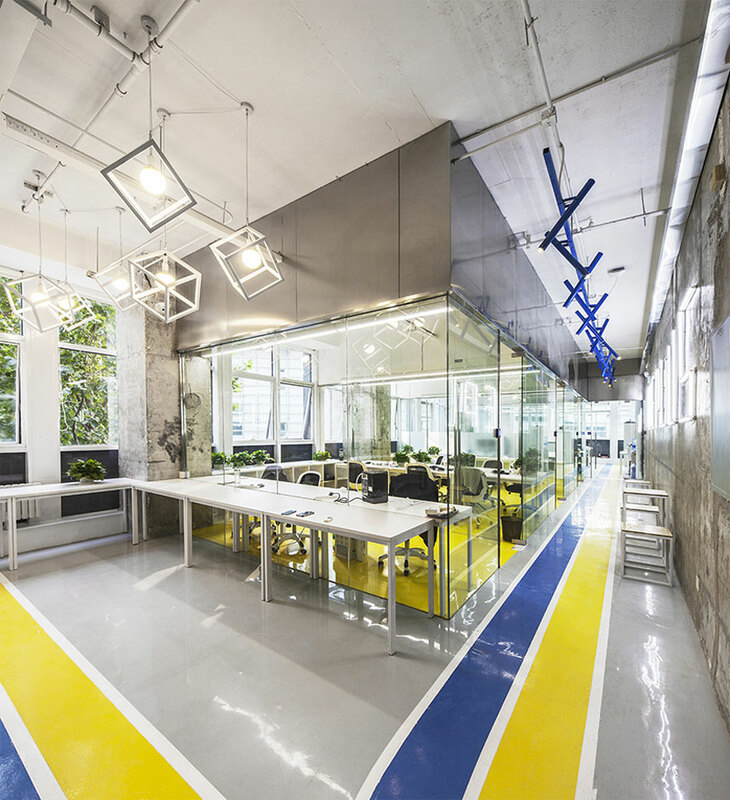 DI Telegraph by Archiproba in Moscow, Russia // This former Soviet telecommunications building in the centre of Moscow has been converted by studio Archiproba into an open plan office for a technology company. 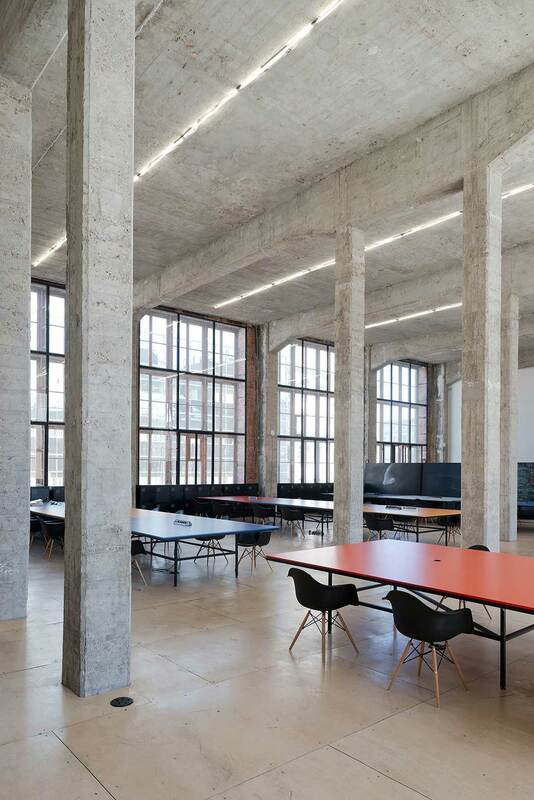 Called DI Telegraph, the new flexible space occupies the upper floor of the 1927 Central Telegraph building designed by Soviet architect and engineer Ivan Ivanovich Rerberg. 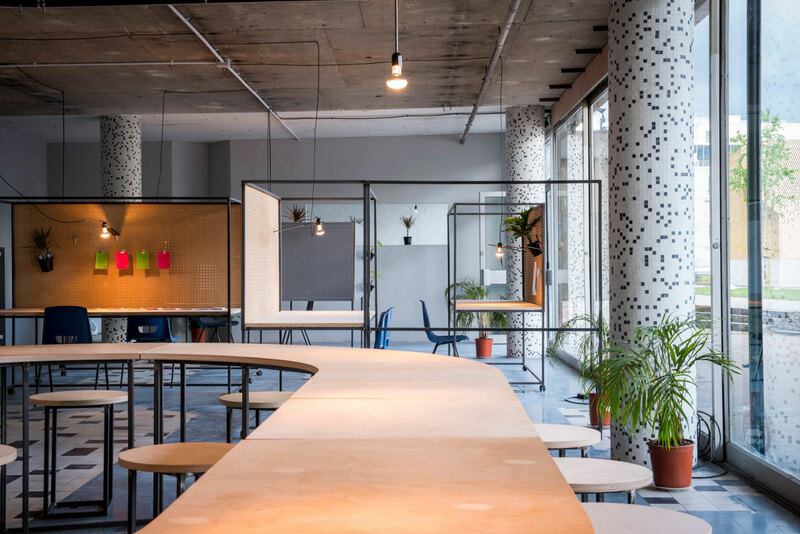 The Moscow-based studio striped the dilapidated building back to it’s original concrete shell to produce an open plan workspace, with desks that can also be rented out to freelancers and other businesses. Images courtesy of ch+qs arquitectos. 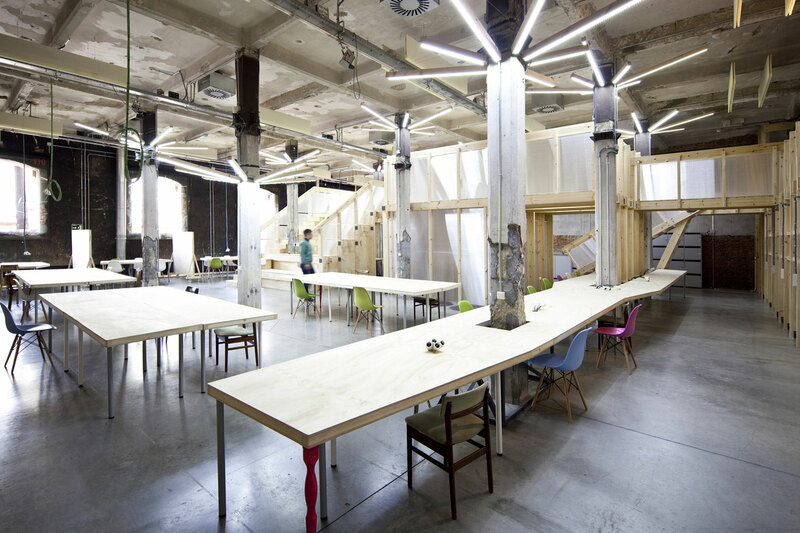 Hub Offices in Madrid by ch+qs Arquitectos // Seriously handsome space, right? 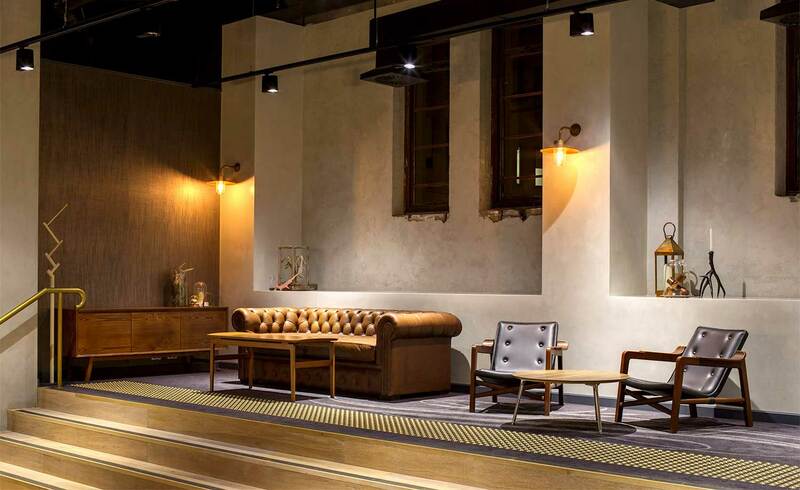 Located in Mardid, this old warehouse was barely touched, the new interior was hardly “designed” – it was rather used as a stage set for a dramatic workspace with oodles of character. Completed back in 2009, Hub Offices measure 310sqm in total. 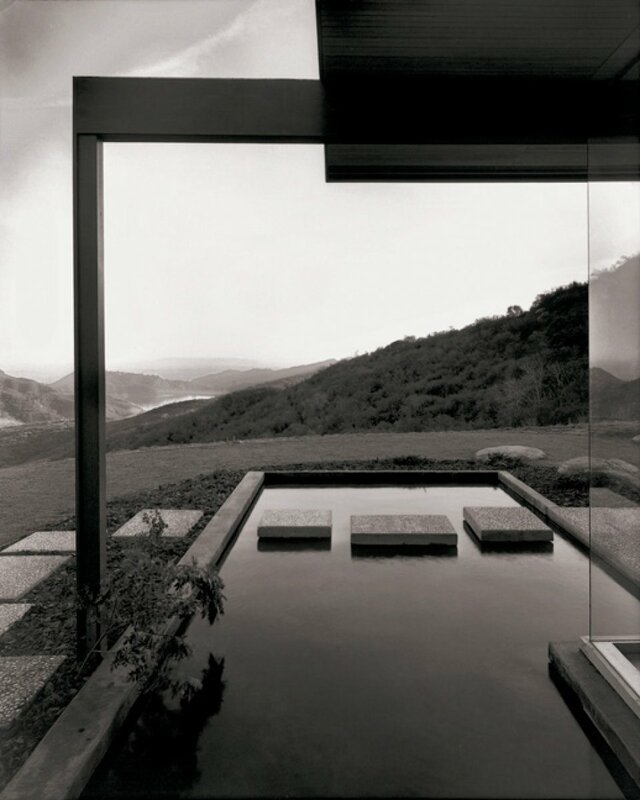 Image courtesy of CH+QS arquitectos. 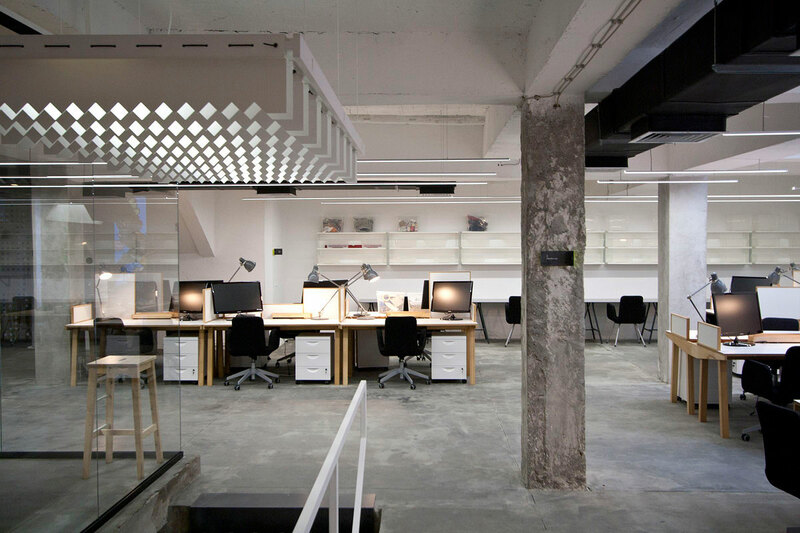 HUBflat Coworking Space by CH+QS Arquitectos in Madrid, Spain // Phwoar! Is your brain short-circuiting and your head exploding with confusion slash excitement? Go on – freak out with me for a while. 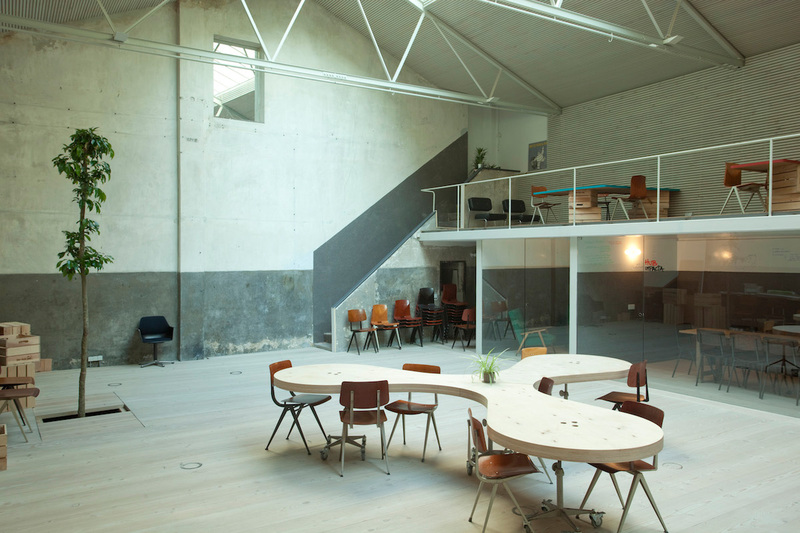 You’re looking at HUBflat co-working space for social entrepreneurs located in Madrid, Spain. 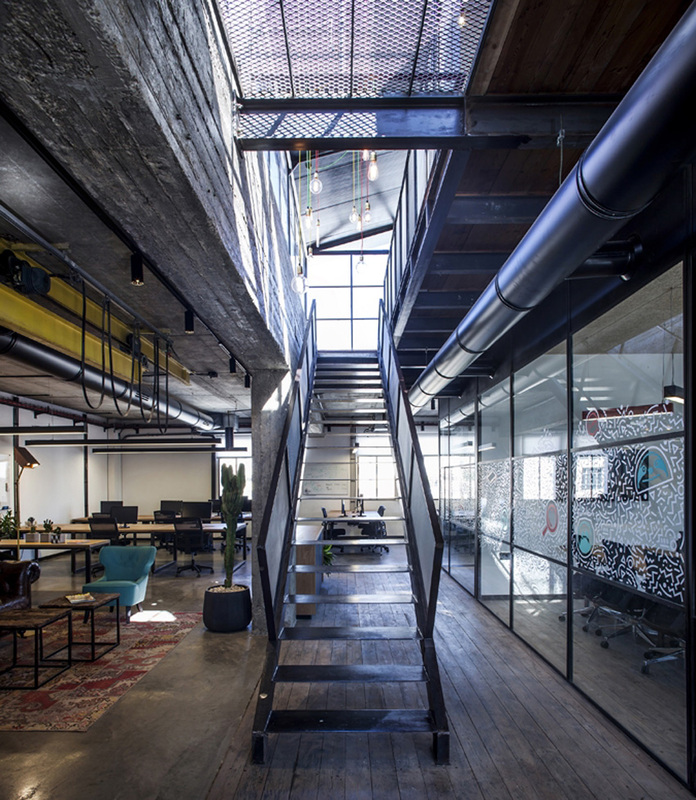 Designed by the local practice CH+QS Arquitectos, the project brief called for a transformation of the original hub into a more interesting and efficient workplace. 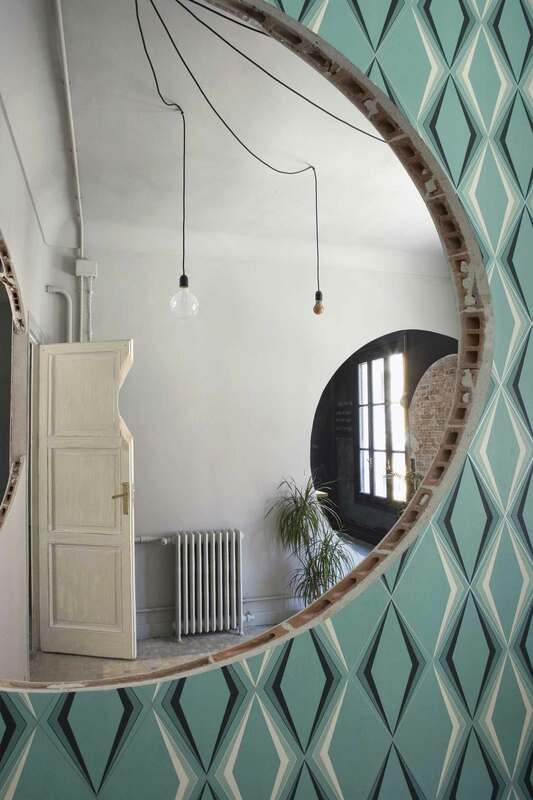 The designers removed some of the parts of the original 1950s apartment to create voids in the shape of a cone and two spheres, bringing visual connection between the different areas. This cunning stunt also acts as a challenging element to the modern architecture, making the interior more playful and more open. 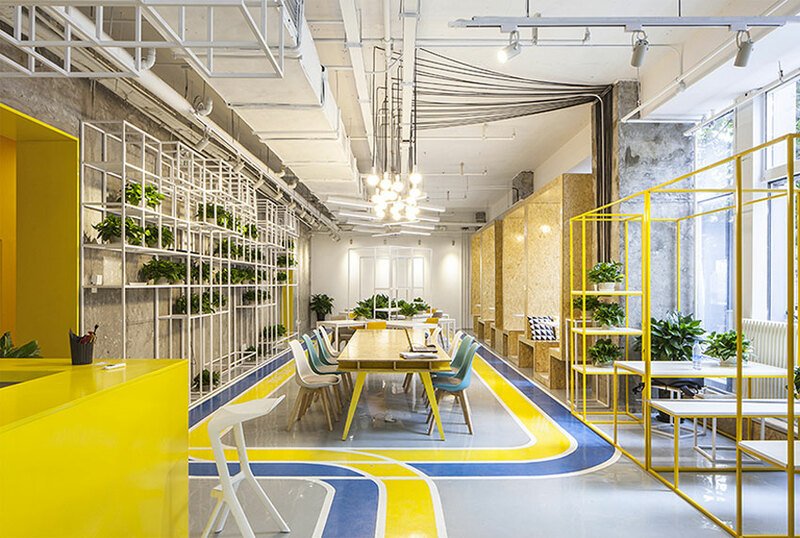 Joint Cafe & Workspace by 56thStudio in Bangkok, Thailand // This clever and savvy co-working space is intended as a “workplace for all”. 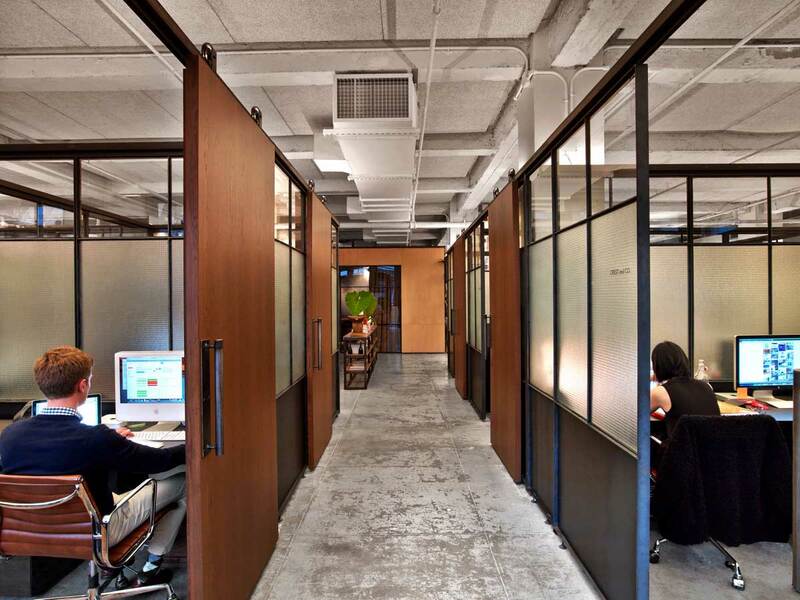 The interior is geared towards professionals who generally work from home and their clients. The interior is kept mostly white to act as a “blank canvas” where occupants and their visitors call the shots. 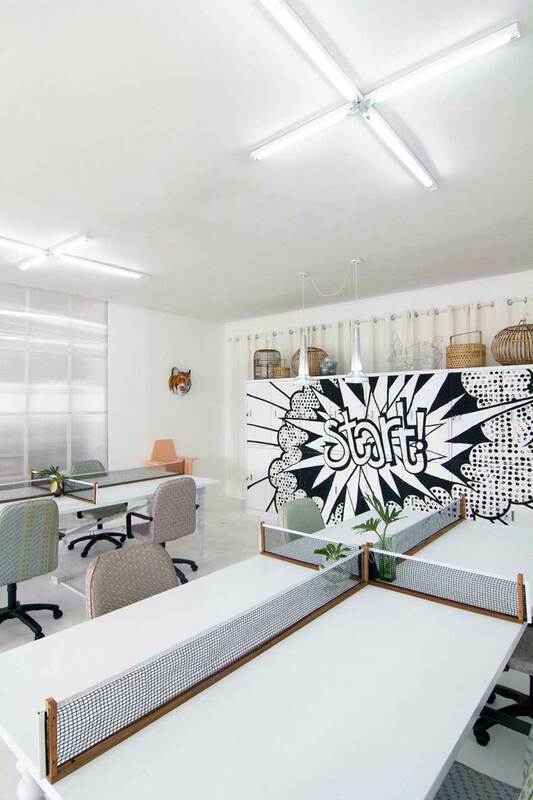 The choice of furniture is super eclectic, mixed and matched with creative props and cool contemporary graphics with black and white pop art illustrations. 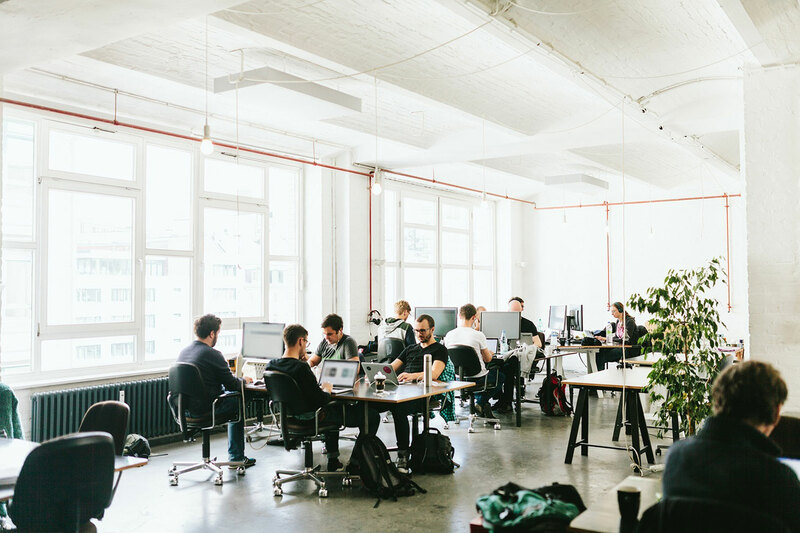 Betahouse Berlin. 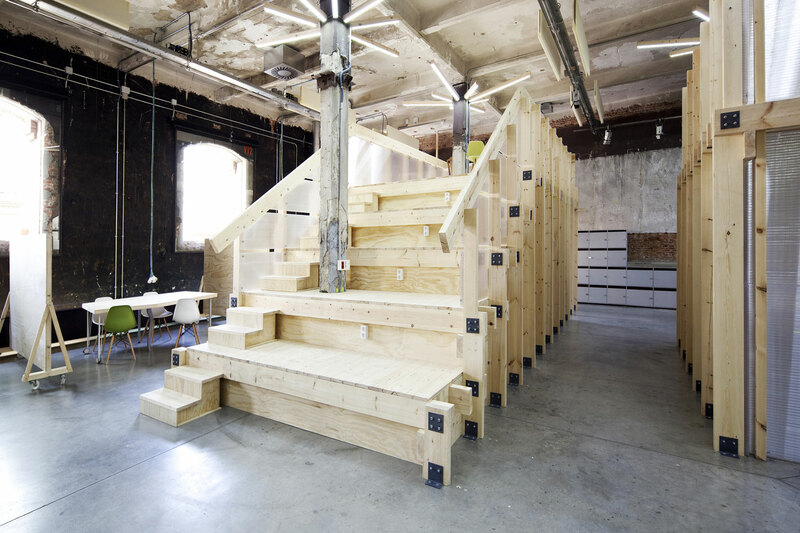 Images courtesy of Betahaus. Betahouse Sofia. 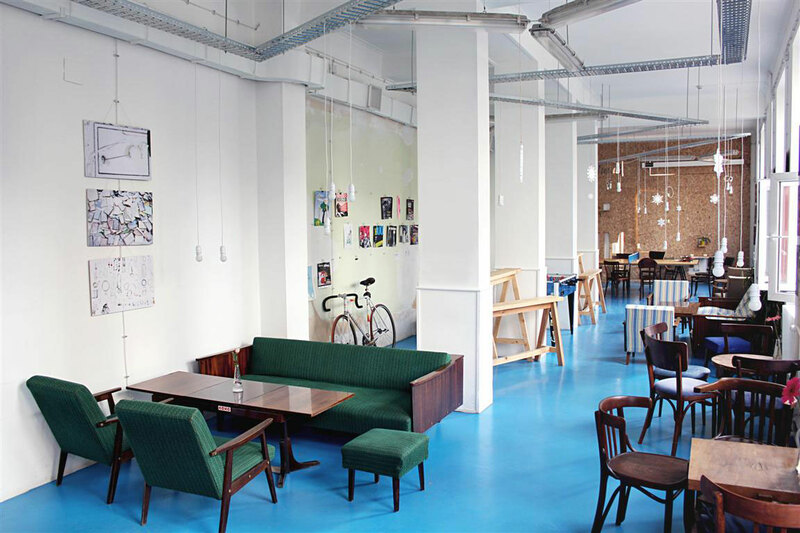 Images courtesy of Betahaus. 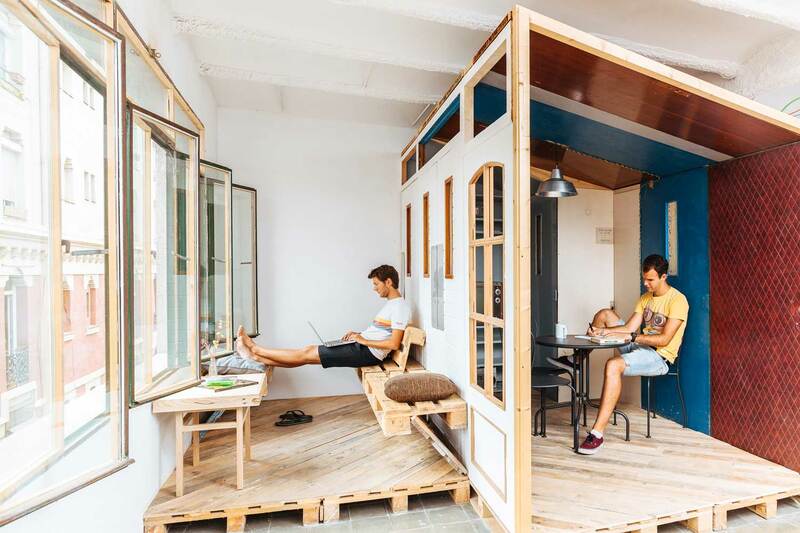 Betahouse Barcelona. 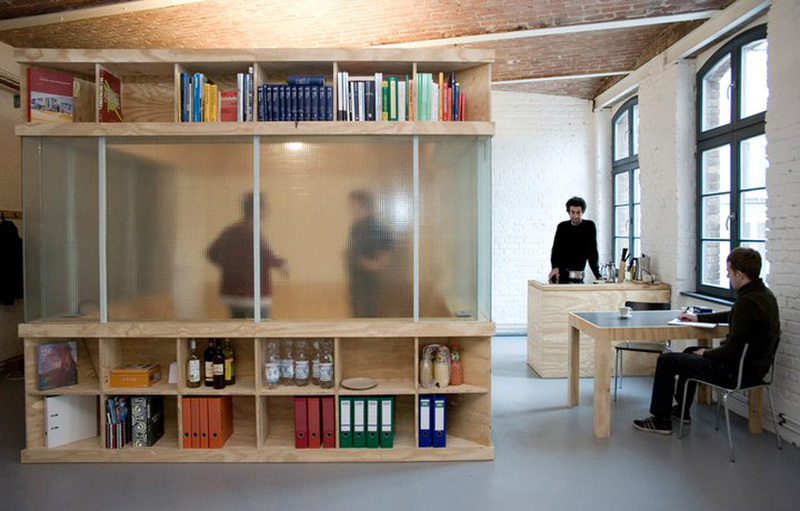 Images courtesy of Betahaus. 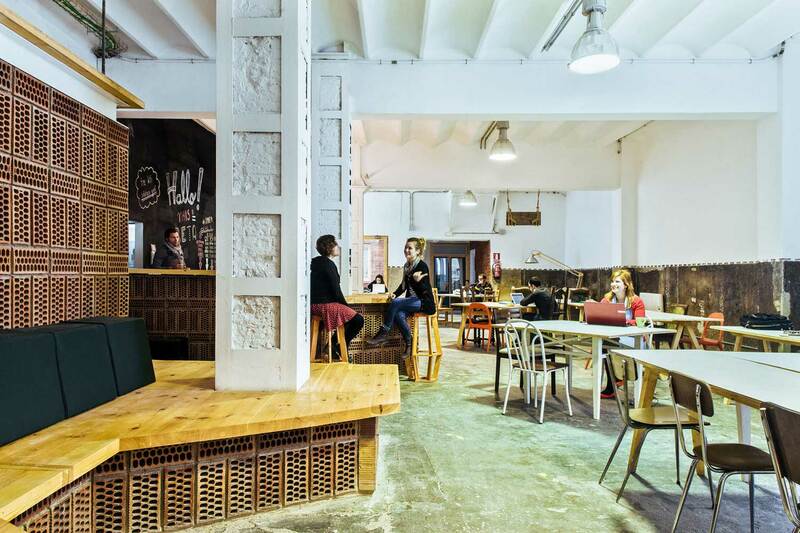 Betahaus Berlin, Sofia & Barcelona // Co-working company Betahaus took over a state-owned building on derelict land in the heart of the creative scene in Berlin’s Kreuzberg, quickly became one of the best known co-working spaces for creative startups. Launched in 2009, it has now moved to several cities across Europe. From 2009, where it started off with 40 members on 400 sqm, today it offers 2,500 sqm to over 350 members. Images courtesy of Paul Maiello & Macro Sea. 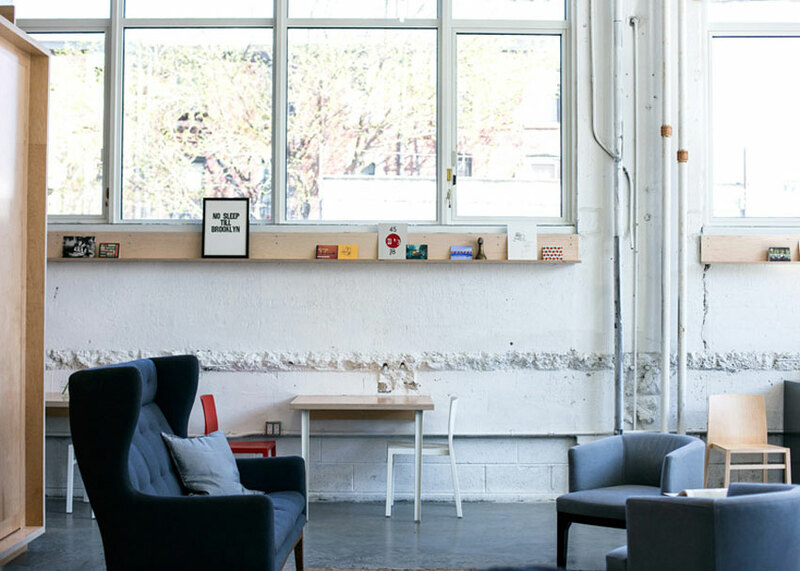 Impact Hub Philadelphia by Paul Maiello & Macro Sea // Over in Philadelphia, local entrepreneur Paul Maiello and developer Macro Sea joined forces to turn a former church in the Northern Liberties area into a 27,000 sq ft co-­working facility. Constructed in 1854, the building has had many lives – from a paper box factory to an electrical supply warehouse – but by 2010 it lay derelict and boarded up. 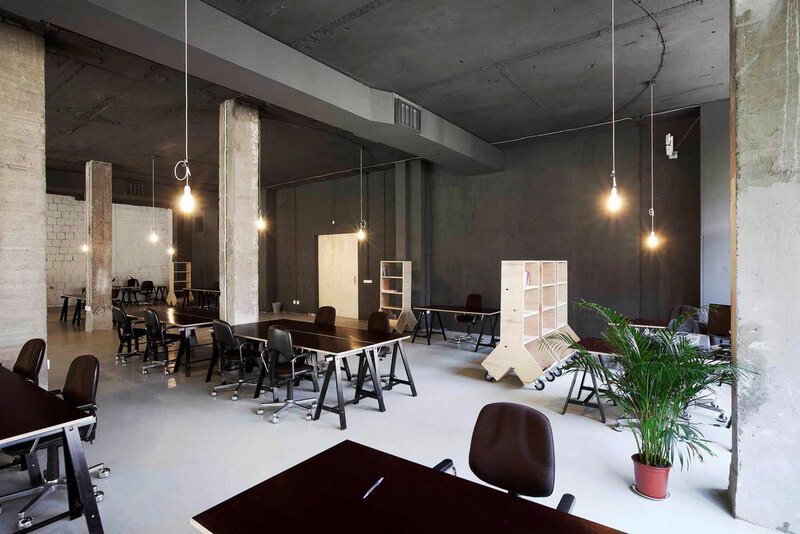 Impact Hub is a co-working space that supports, nurtures and fosters Social (impact) Start-Ups. 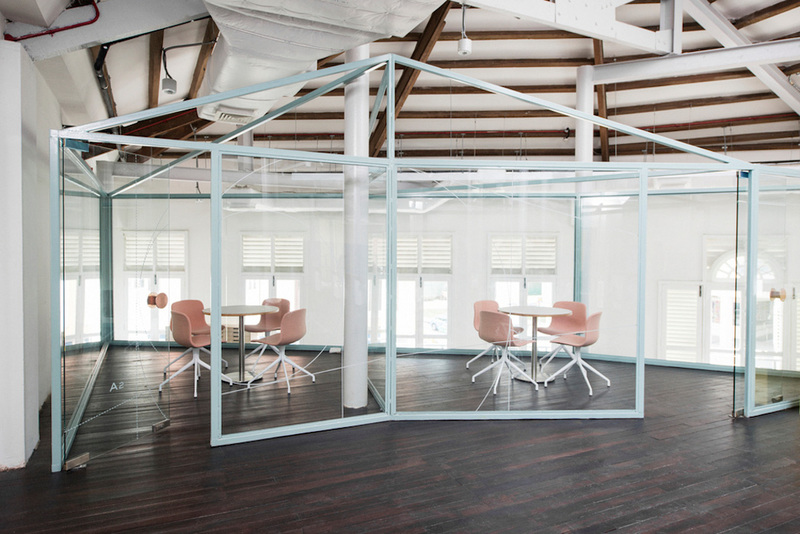 The concept caters for a wide variety of spaces, such as dynamic work areas, focussed works areas, chill-out space, traditional offices, workshops, and event slash meeting rooms. 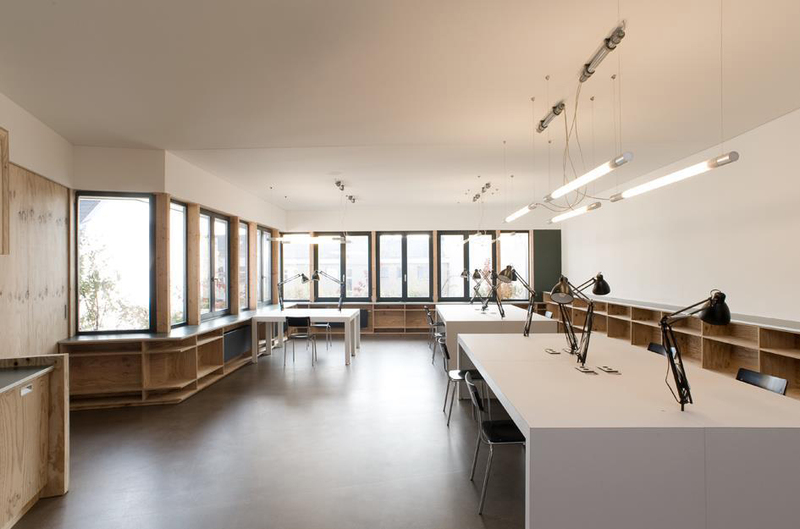 Impact Hub Berlin Office by Leroux Sichrovsky Architects // Leroux Sichrovsky Architects have developed the second co-working office location for the social impact organisation Impact Hub. Inspired by the concept of second skin, the new interior folds, blends and wraps itself into the new space, and onto the existing building situated at Mehringplatz in Berlin’s Kreuzberg. 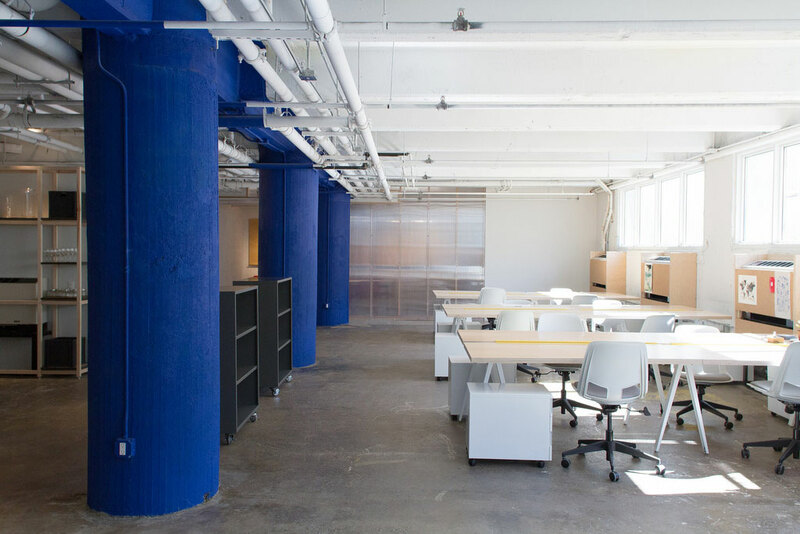 Similar to it’s Philadelphia predecessor (above), the workplace provides a variety of spaces that support and nurture Social Start-Ups by catering for a wide variety of spacial typologies. 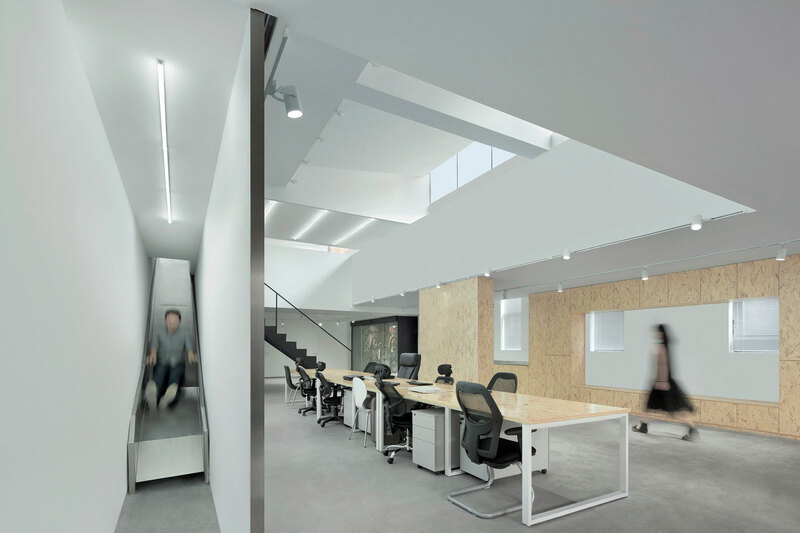 Mozilla Japan Open Source Office by Nosigner // Mozilla’s new Japan office by Nosigner has been designed to reflect the web browser’s open source approach and software. 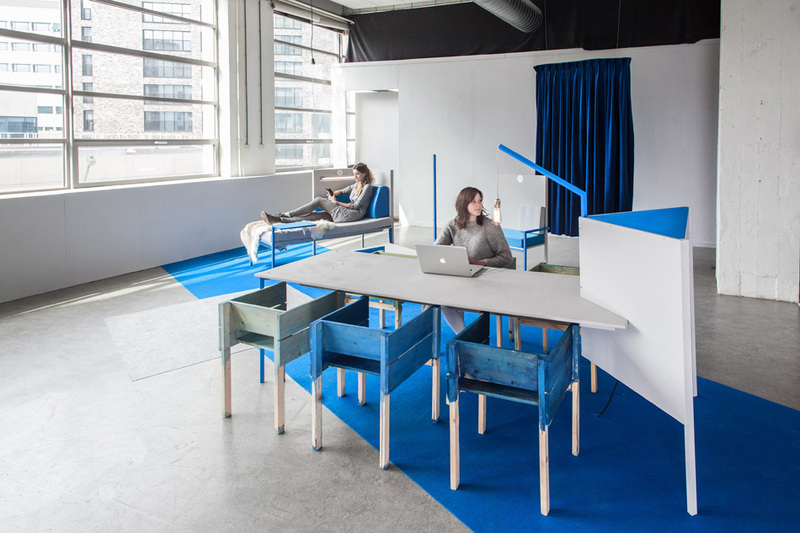 The studio has developed an accessible furniture system which has been employed to fitout the workspace. 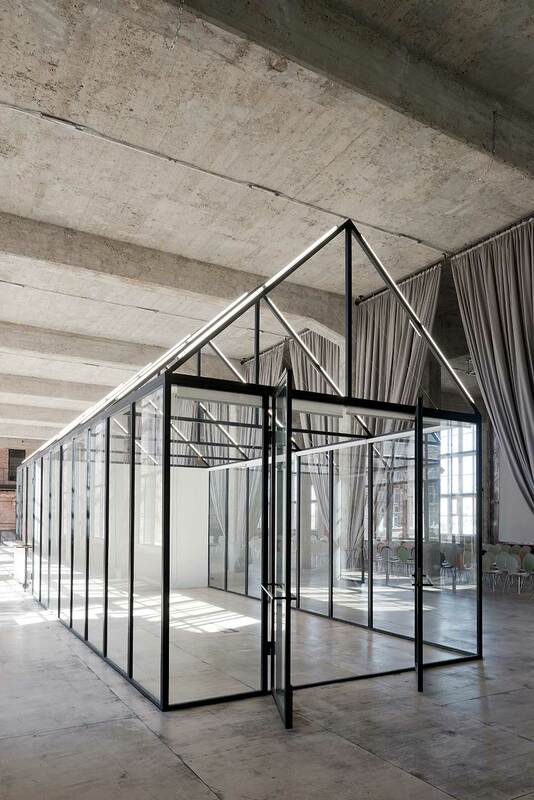 The ‘Mozilla Factory’ is constructed from common components (open source furniture) which include polycarbonate panels that allow individuals to easily edit their space accordingly. These corner modules assist in composing essential space elements such as a desk, shelf or light. 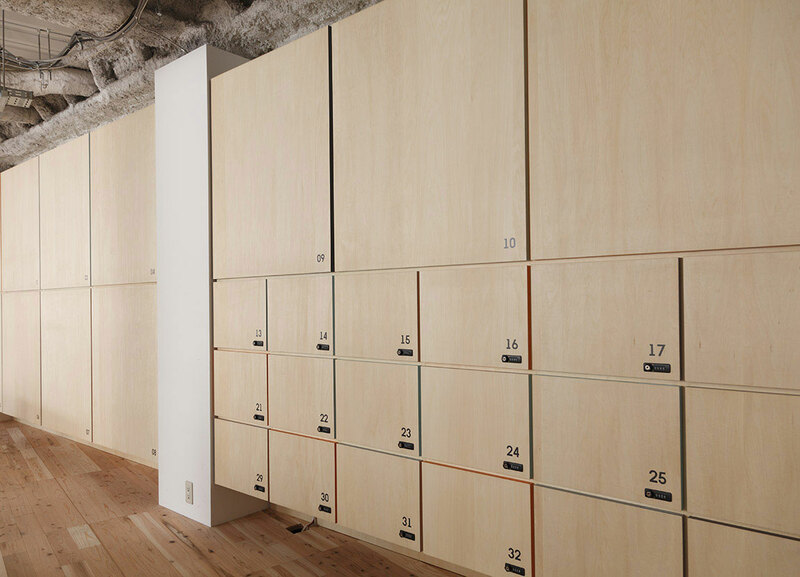 The floor system is made of plastic palette units covered with wood panels which have inspection doors set within each unit for hiding cables. The designs which furnish the ‘mozilla factory’ are free to download – the general products and all drawings are uploaded to the web), enabling anybody to use the software and construct their own inexpensive and functional office. 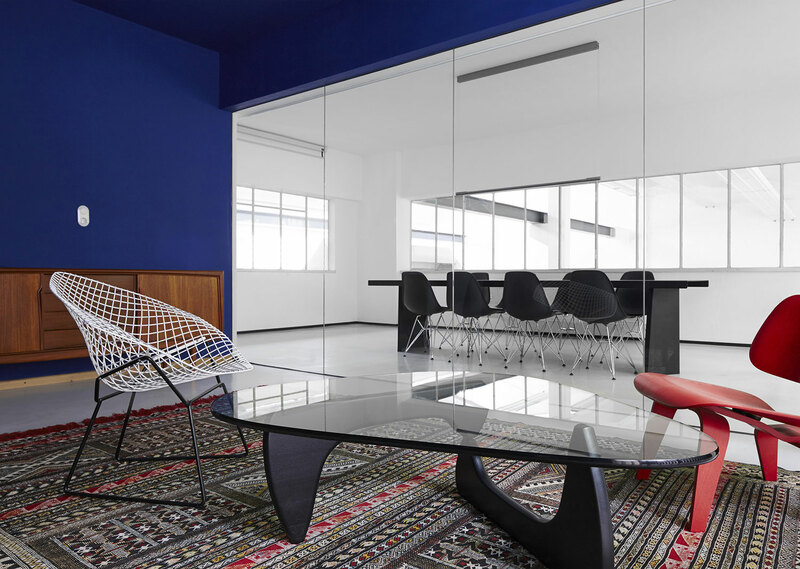 Cottrell House London by The Decorators and Meanwhile Space // A dilapidated car showroom in north-west London has been transformed into a flexible workspace by Hackney designers the Decorators and community initiative Meanwhile Space. 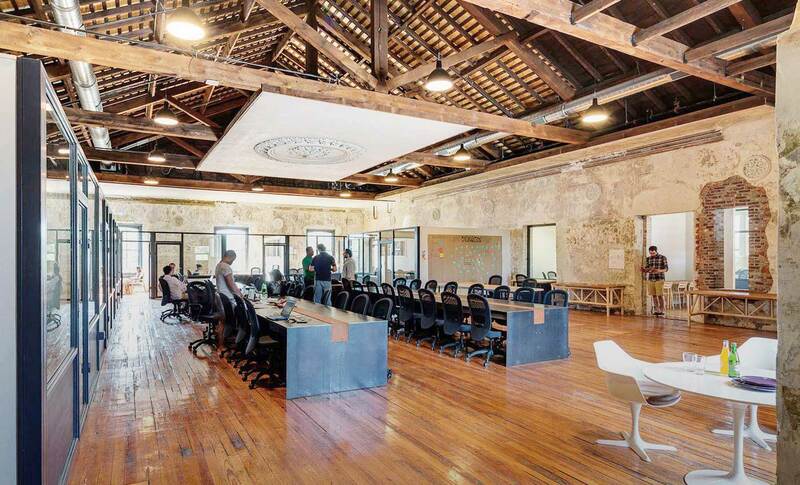 Meanwhile Space set up the communal office for creatives to hire. Cottrell House is located on the ground floor of a vacant building close to the stadium and arenas in Wembley. 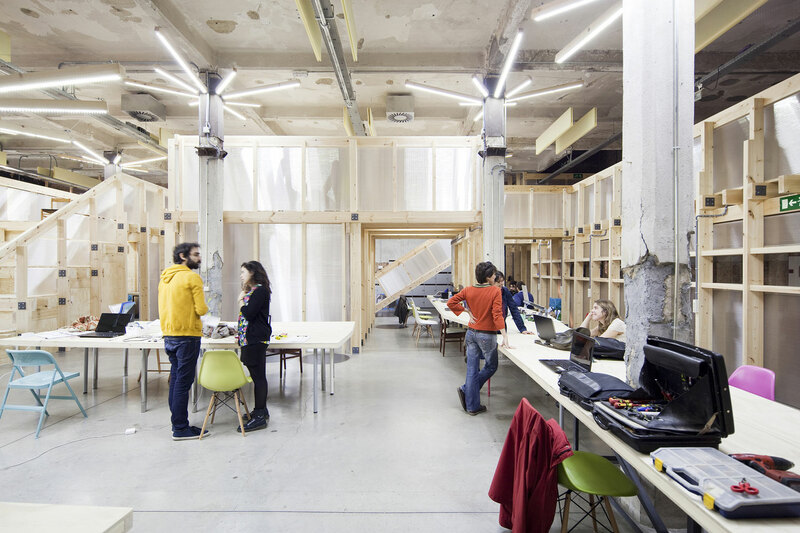 Factoria Cultural in Matadero in Madrid by Office for Strategic Spaces // FCMM is the adaptation of medium-sized hall in Matadero Madrid to house an incubator for cultural industries. 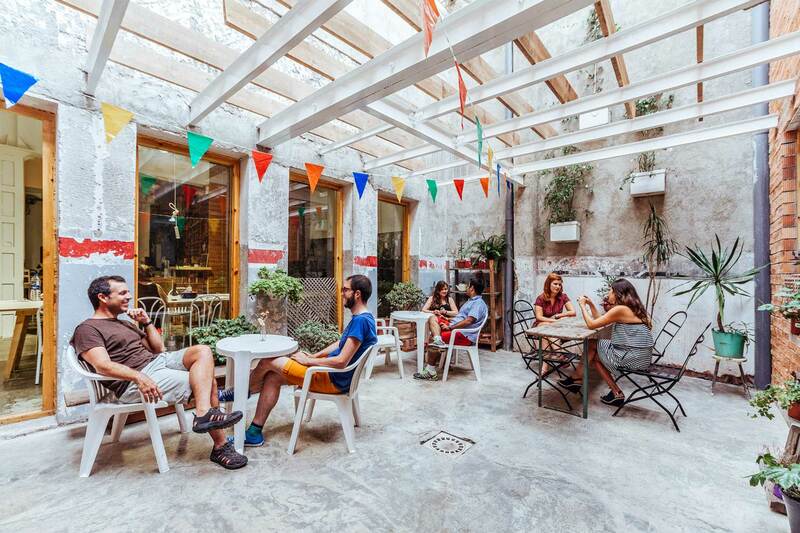 The project is perhaps typical of crisis-stricken Europe, and particularly Spain, where the architects had to find a way out of the opposing tensions of having no money and big needs. Using very few, cheap, and easy to install materials, the architects tried to achieve as many different and distinct work areas as possible, adapted to different needs. Images courtesy of Forge & Co. 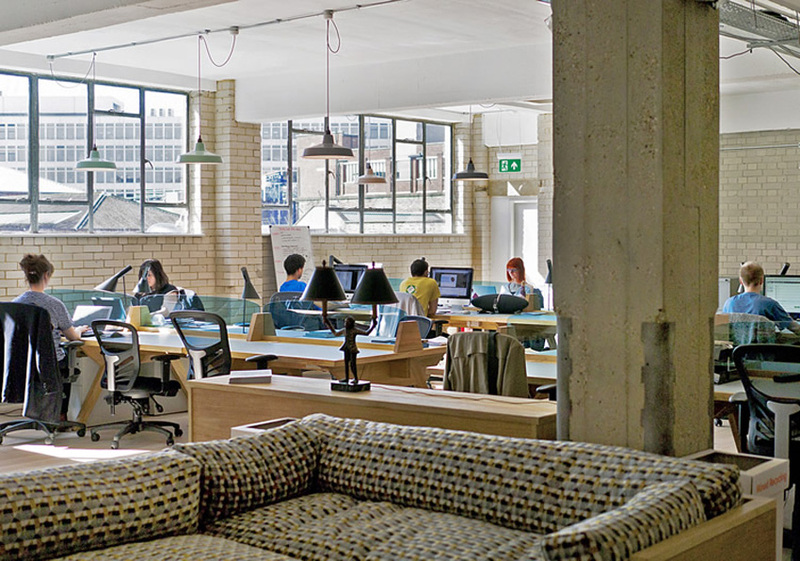 Forge & Co in Shoreditch, East London // Forge & Co provides ‘social working’ spaces for an always-on culture. 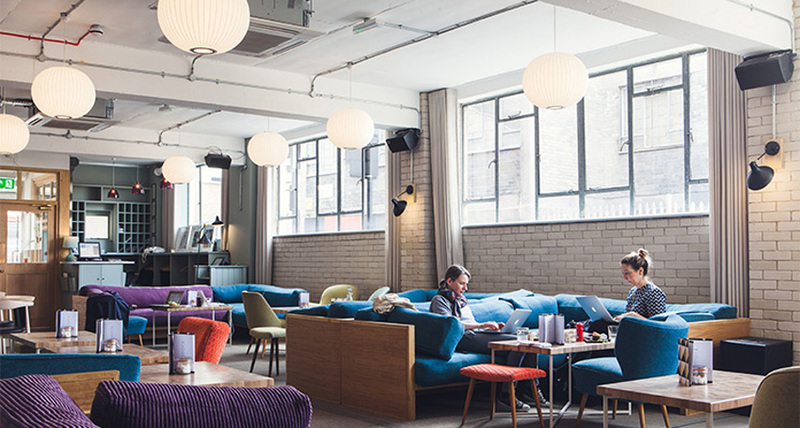 The venue offer all-day, high-quality casual dining, public lounge areas, and co-work environments welcoming all vocations, both from their flagship site on Shoreditch High Street and their collaboration with Heal’s on Tottenham Court Road. Photography by Jihye Choi & Youngchae Park. 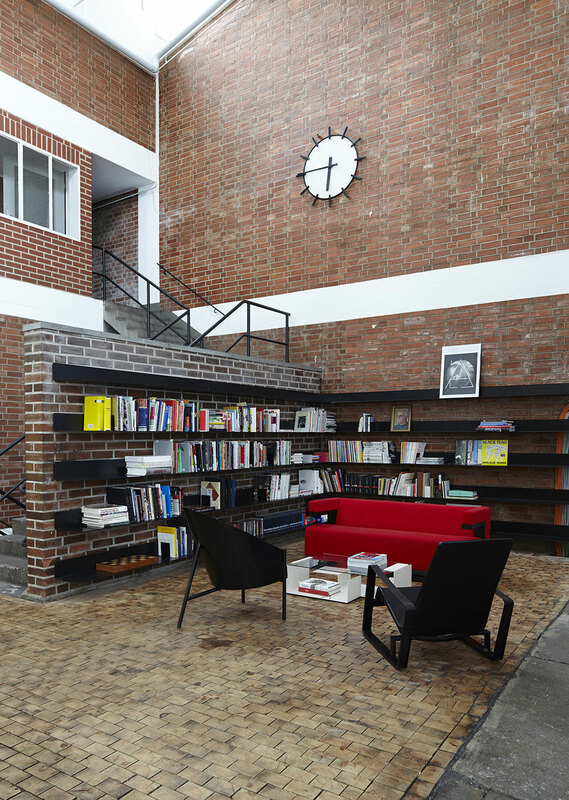 HUB Soul by Hyunjoon Yoo Architects // Seoul’s HUB is a space intended for people who want to start their own business. City of Seoul supplies the space, the human network, the education and some financial consulting. The facility is free thanks to the municipal financial support. Ummm – amazing! Unsurprisingly, many young adults gather in the space in order to realise their future vision. 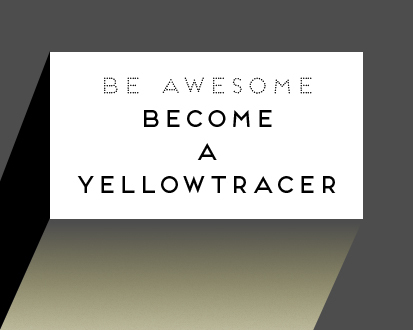 Anybody who intends on starting their own business can apply for the space. 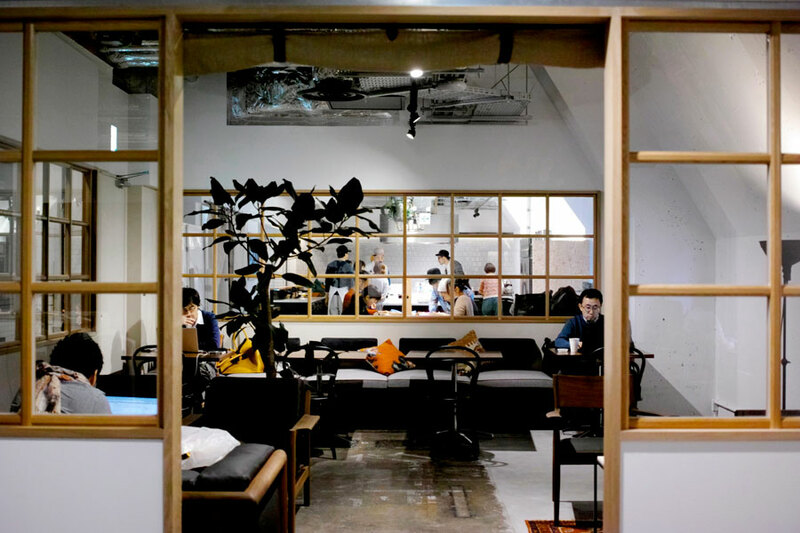 There are two groups housed here; “Social Business Association” and “Jobs for Young Adults” which supply the space and free consulting for six months until individuals are ready to launch their own business. 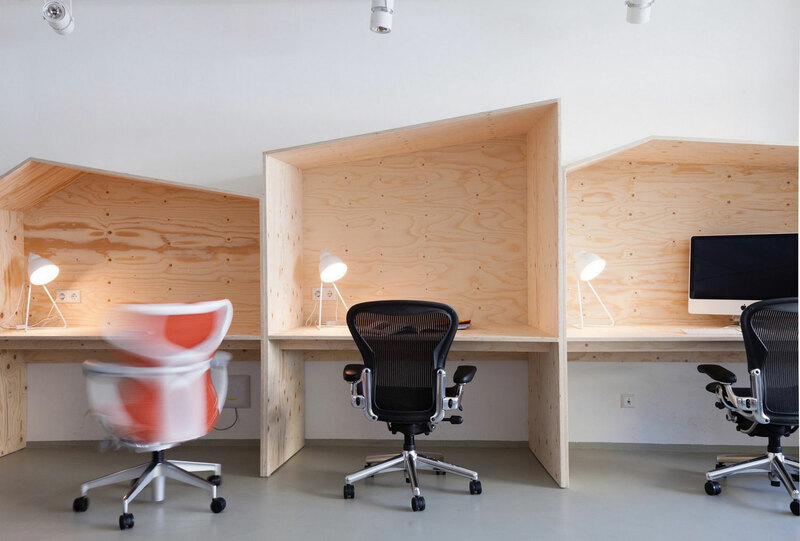 Initially, each application will start in the open office area, sharing desks with other members. 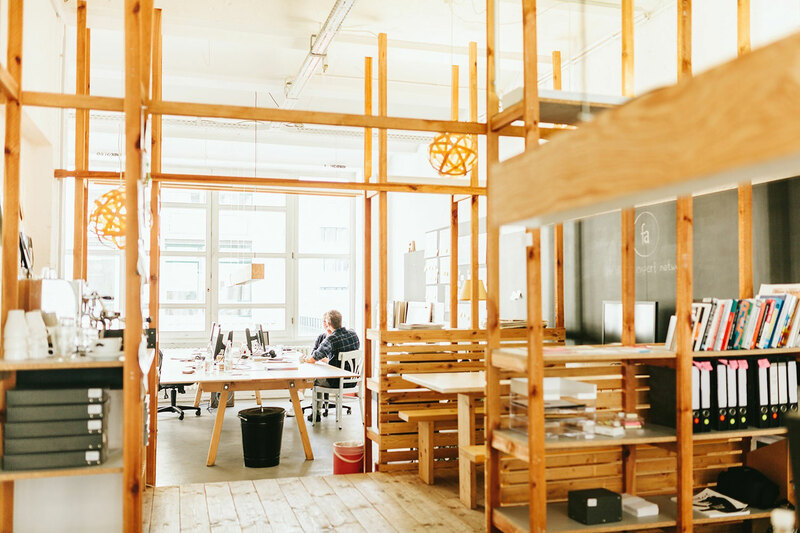 Once their business plan matures, the team moves into individual offices. 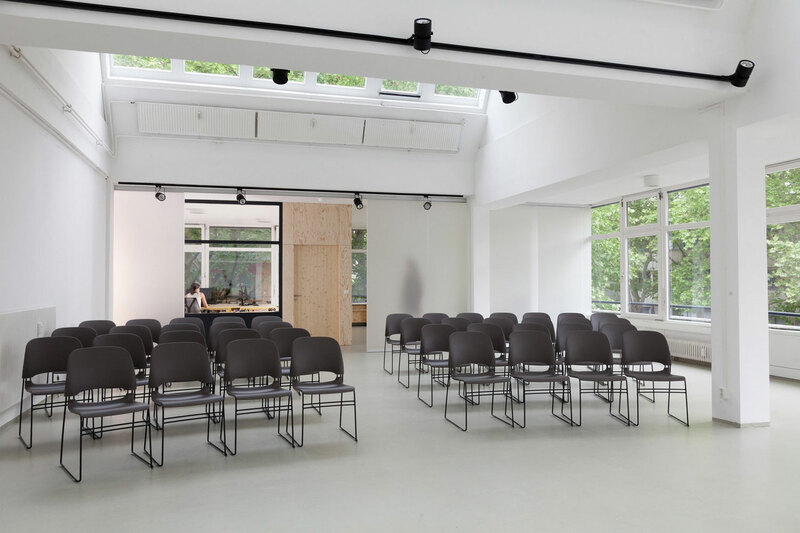 The overall space was designed as a small town, measuring 3,200 sqm, and accommodates a restaurant, a library, seminar rooms, lecture halls, a cafeteria, a concert hall, a gift shop, the head offices etc. That’s it – I’m moving to Seoul! 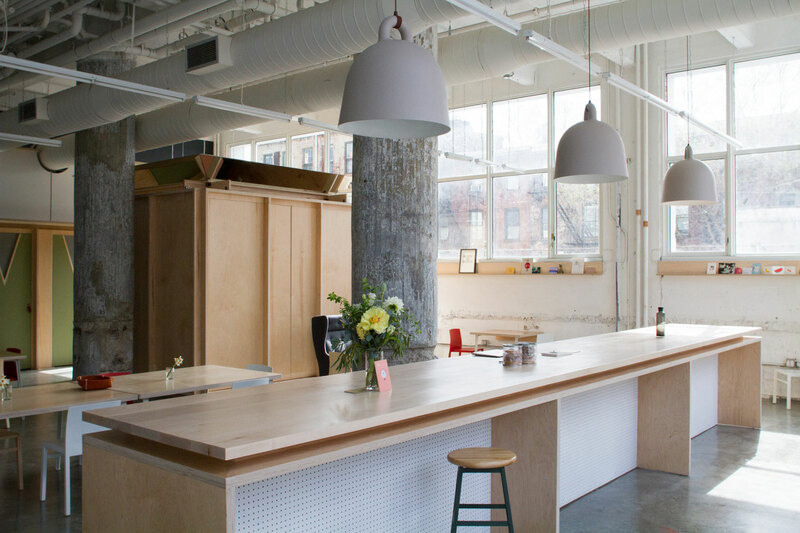 Makeshift Society Brooklyn Workspace by Dash Marshall // Architecture firm Dash Marshall has converted a former pencil factory into a shared workspace for Brooklyn’s creative entrepreneurs. 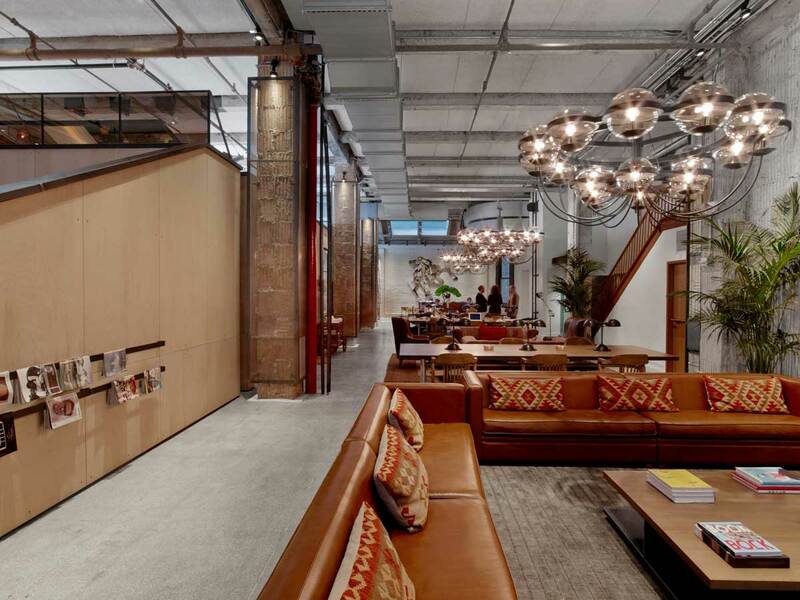 Following a San Francisco branch that opened in 2012, the Brooklyn space occupies 370 sqm across the ground and basement storeys of a factory originally built in 1907. 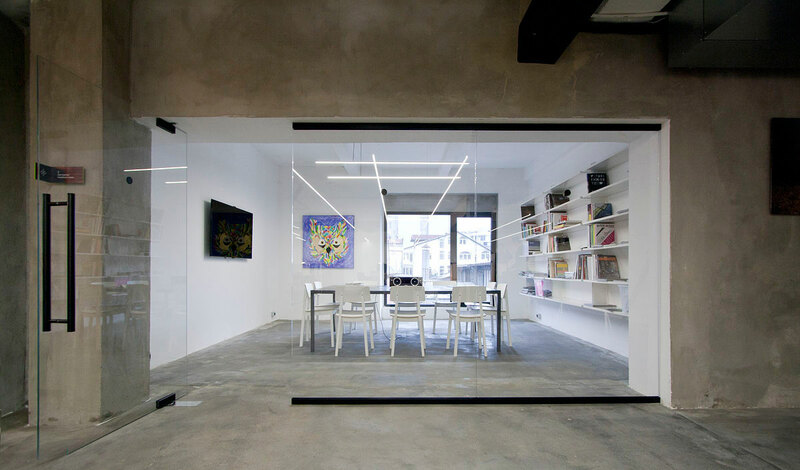 The studio stripped back columns to expose the concrete beneath the previous finishes, while the rough wall surfaces have been whitewashed. Images courtesy of MAT Office. MAT Office Creates Flexible Coworking Space in Beijing // MAT Office, a research and design studio based in Rotterdam and Beijing, is dedicated to the observation and speculation of emerging issues related to contemporary urbanisation processes, aiming to seek architectural solutions to arising problems. 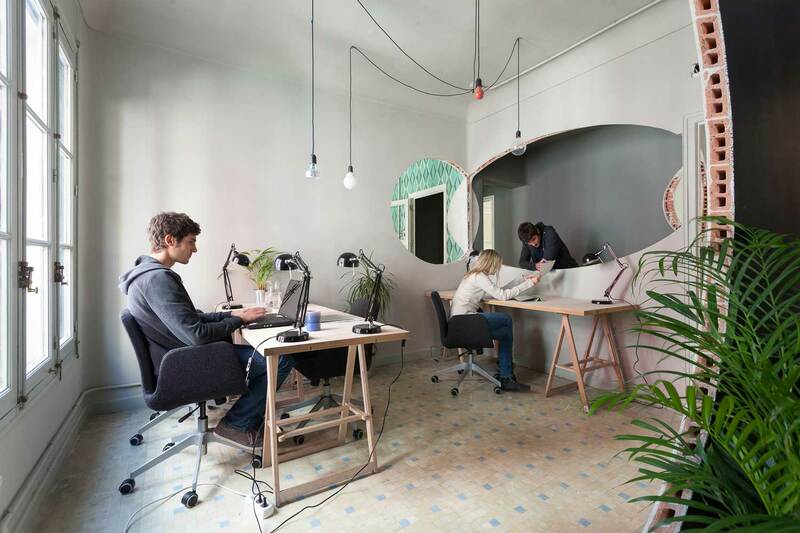 When faced with the task of renovating three of floors of an apartment building into a coworking space, a research-based design method was introduced by the architects, resulting in a flexible space-sharing model. A big discussion table serves both groups and individuals, while more privacy can be found in the booth area, suitable for small groups. 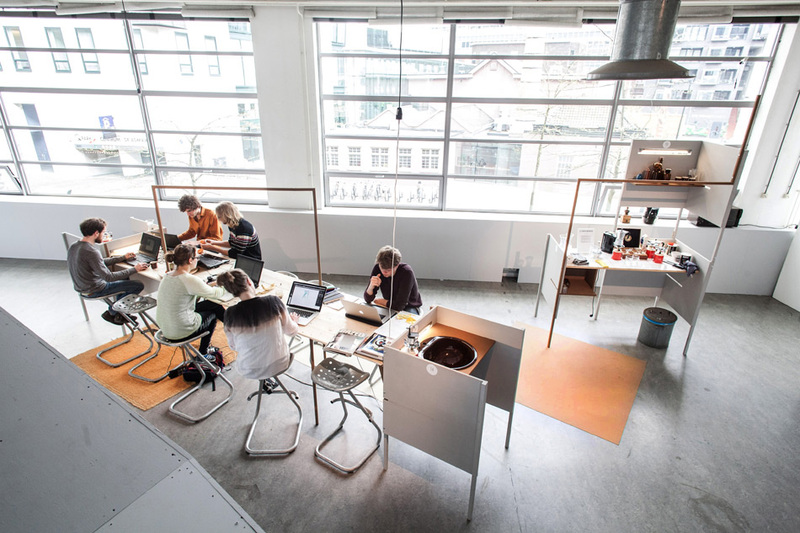 Workstations are provided for those in need of complete isolation. Besides the library-like experience, an area has been adapted to serve as an exhibition space. Jingyuan No. 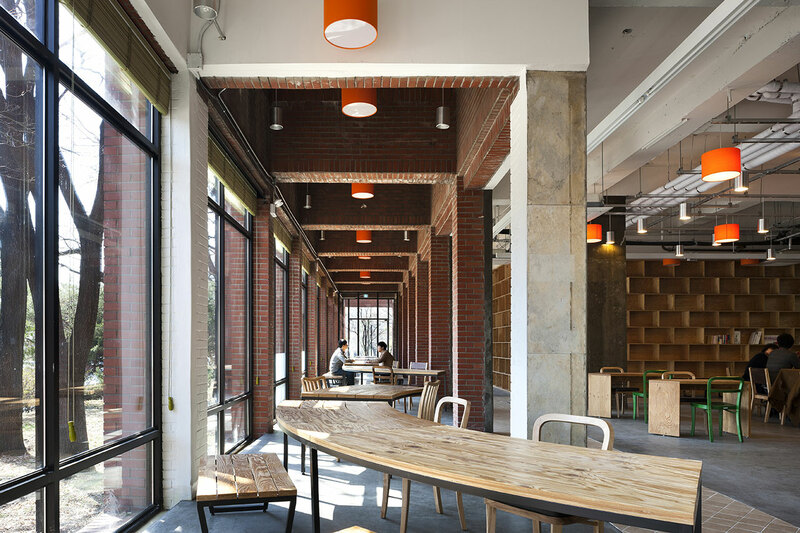 22 Coworking Office in Beijing by C+ architects // Jingyuan No.22 is a transformation of an old 330sqm cotton warehouse in Beijing, China into a coworking office owned by two young Internet finance companies. Local practice C+ architects created an interactive space with multiple possibilities and narratives through furniture layouts and natural light control. 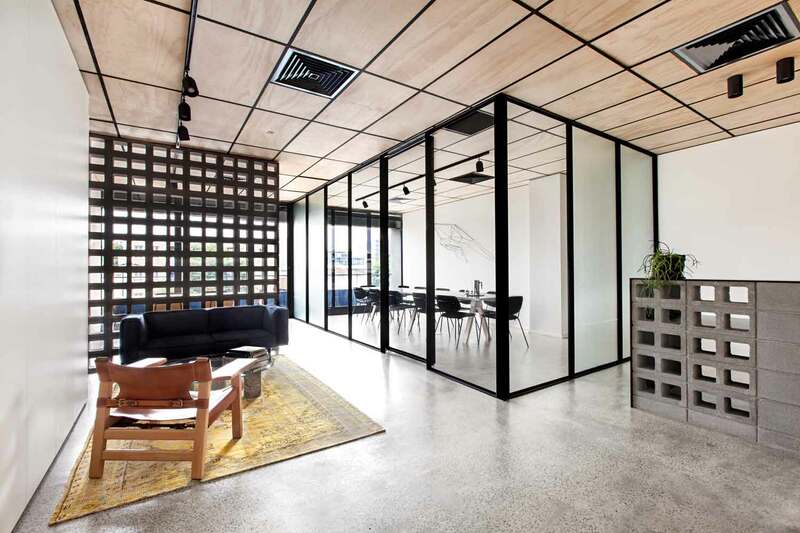 Blackwood Street Bunker by Clare Cousins Architects: Shared Office Space in Melbourne // Clare Cousins Architects have re-designed this 1970’s office block in North Melbourne into their own workspace shared with a construction company. Interior fittings are picked out in black or white to distinguish among the diverse regions of the two occupants. 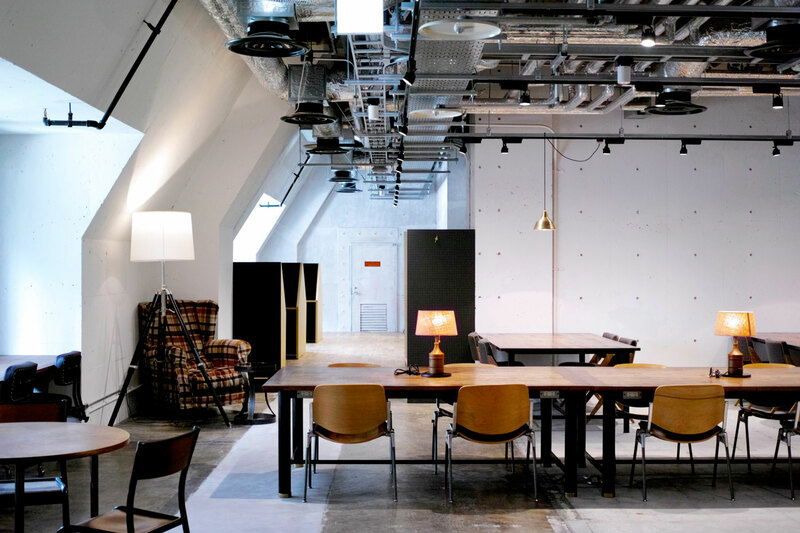 The shared ‘Blackwood Street Bunker’ workplace retains the shell and reuses parts of the original fit-out, to create a non-corporate environment that evokes a sense of authenticity and capability. 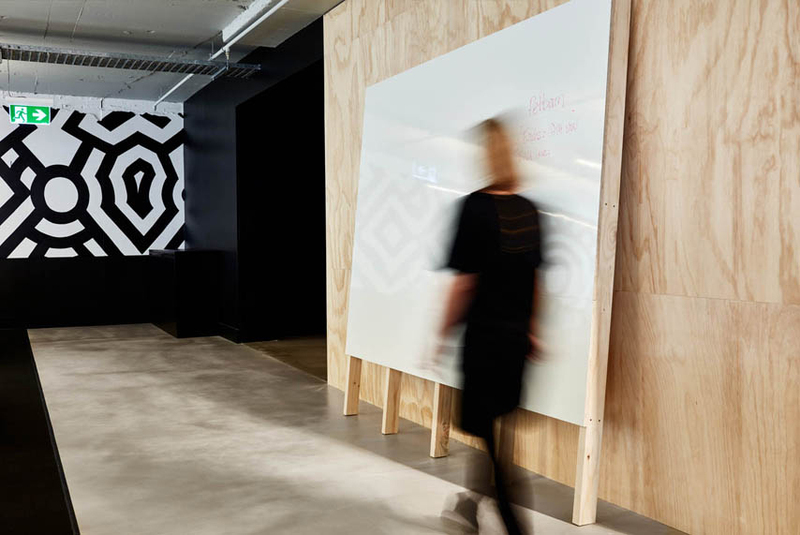 Edge Agency & Creative Oasis’ Workplace by MAKE Creative // MAKE Creative were commissioned to design a new workplace for Edge Agency and Creative Oasis in Sydney’s Surry Hills. 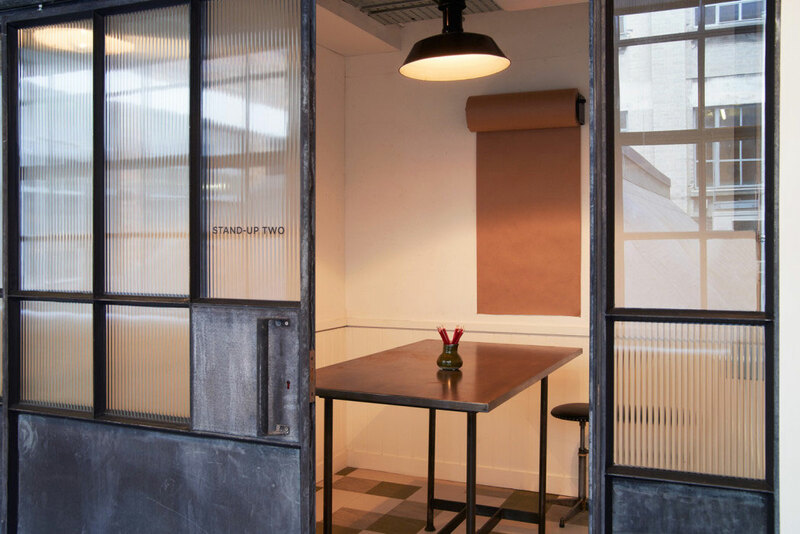 The designers worked with a low budget to create a striking, raw space with industrial overtones. 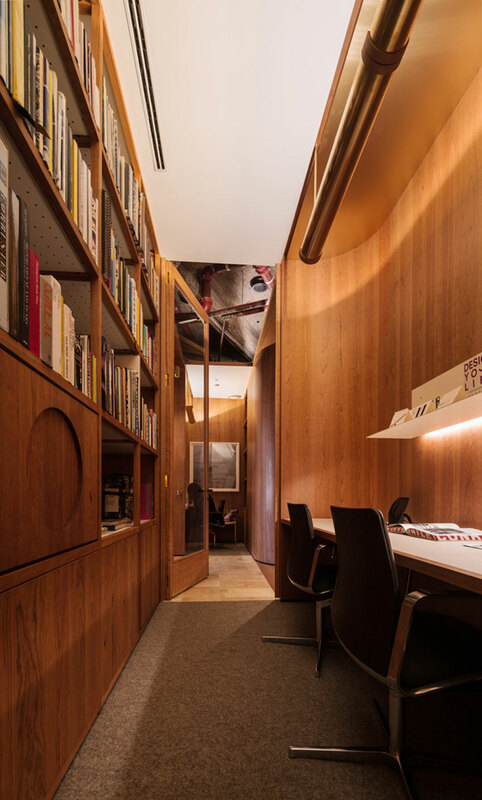 The 700sqm tenancy in a 1970s office building houses 80 people in a flexible and informal workplace. 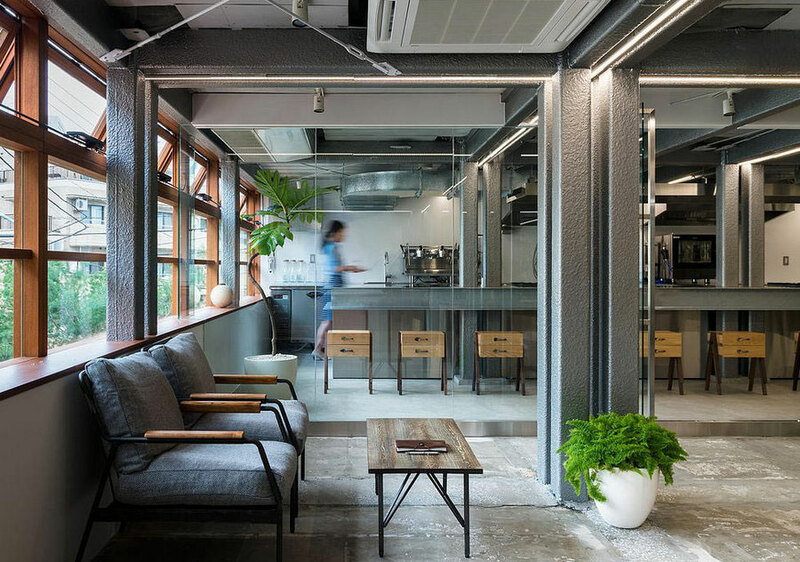 Multi-purpose shared space by Hiroyuki Tanaka in Japan // A concept of leasing out privately owned buildings to the artistic and creative community has slowly become popular in the city of Yokohama in Japan. 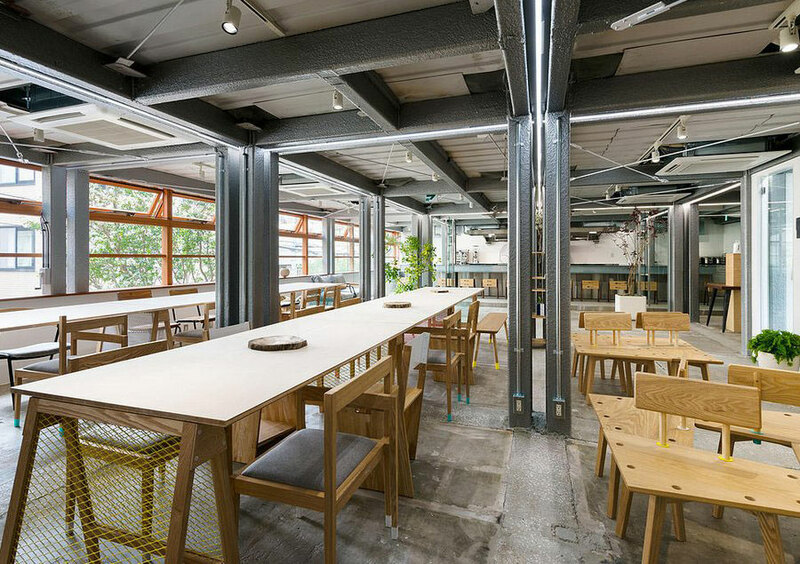 Originating in 2014, the first of its kind – called ‘Bukatsudo’- serves as a multi-purpose, shared community hub. 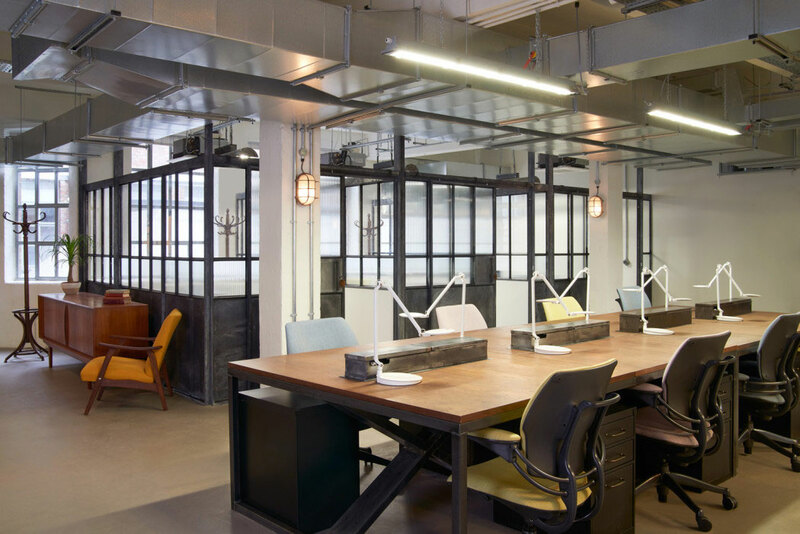 Diversely furnished to keep with the industrial aesthetic of the building, the space has been organised with the use of few partition walls. 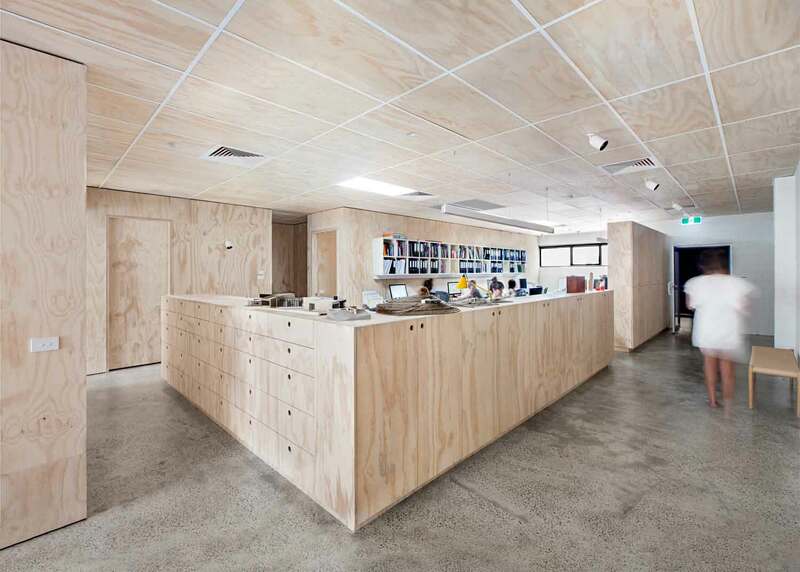 The open-plan scheme hosts a co-working theme – coffee stands; a kitchen; hall; and craft workshop. The individual pod-like rooms can be rented out for evening courses and study. 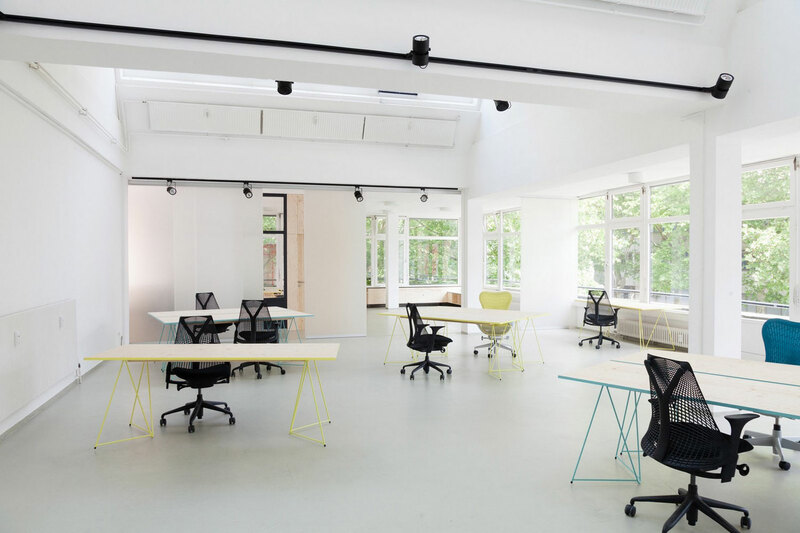 Nova Iskra Design Incubator by Studio Petokraka in Belgrade, Serbia // A rundown office space of 350 sqm in the Gavrila Principa Street in downtown Belgrade has been fully reconstructed by the Belgrade-based architecture studio Petokraka. The interior makeover balances between intact, rough treatment of the pillars and walls, and custom elements specially designed for the space, all with the aim of serving the functionality of the concept. The visual presence of the project is enhanced by graphic design and identity developed by Metaklinika studio. Images courtesy of Raumstation Berlin. Raumstation Berlin // Raumstation is situated in Berlin Moabit, right in the Stephankiez and close to Berlin’s main train station. 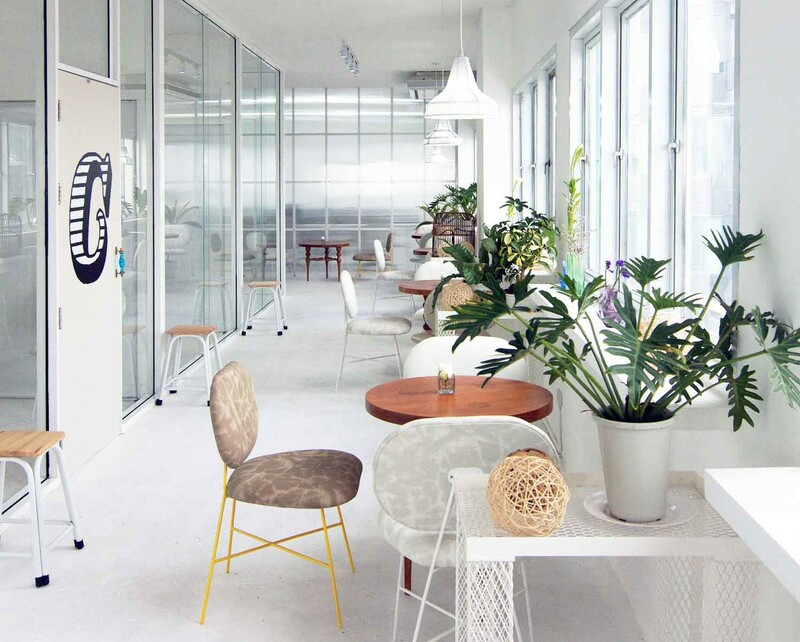 Here, freelancers not only find an ideal place to work but also a colourful international community, hailing from all different areas of the (creative) economy, media, IT, music and NGO. The owner acquired the entire building at an auction, and was able to expand over several floors. Each of the four floors has its own infrastructure, with a large working chamber and an open kitchen, accommodating up to ten coworkers from all professions on each level. 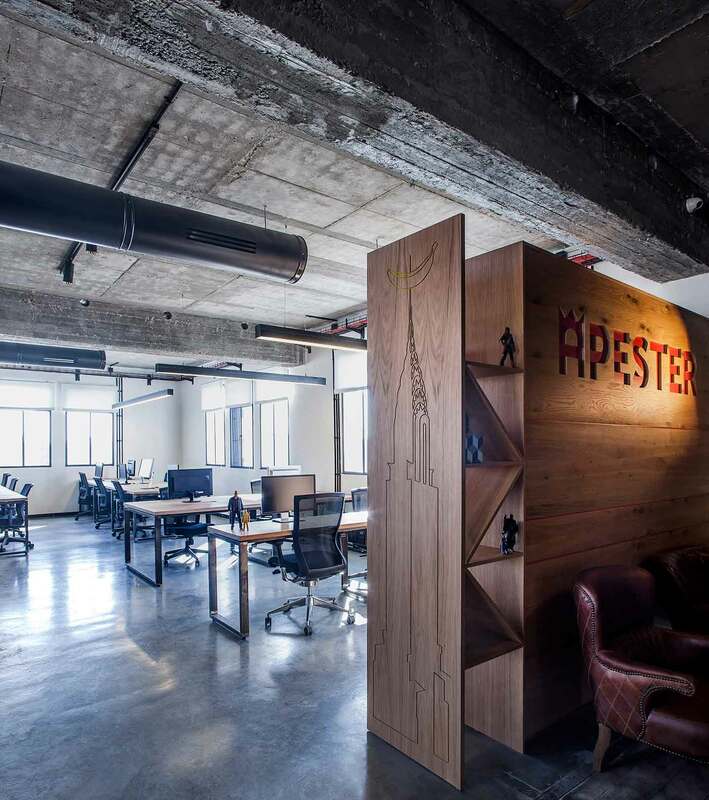 Co-working space by Roy David Studio in Tel Aviv // A unified working environment for two creative companies – Apester and Co-Cyles – was designed by Roy David Studio to mix-up private and communal areas in a relaxed and eclectic loft-style interior. The visuals add a shot of vibrancy, set against a raw material palette of blackened steel and exposed concrete. 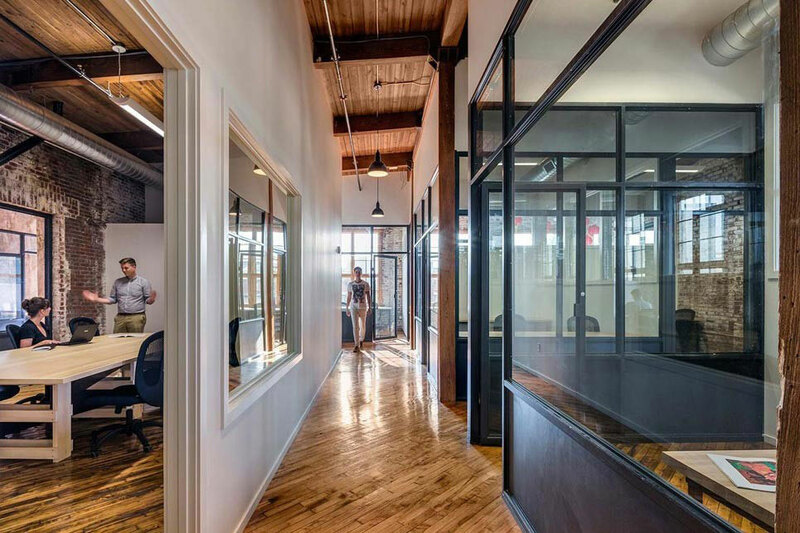 The office is laid out over two storeys in a newly-renovated building, with design interventions applied that purposefully ensure it retains an industrial feel. ‘The firms were searching for a design that would be characterised as being youthful, innovative and one that has an overall coherent style. The materials were specially chosen in order to accentuate an architectural discourse dictated by industrial and lo-fi design elements,’ says the architect. Images courtesy of The Working Capitol. 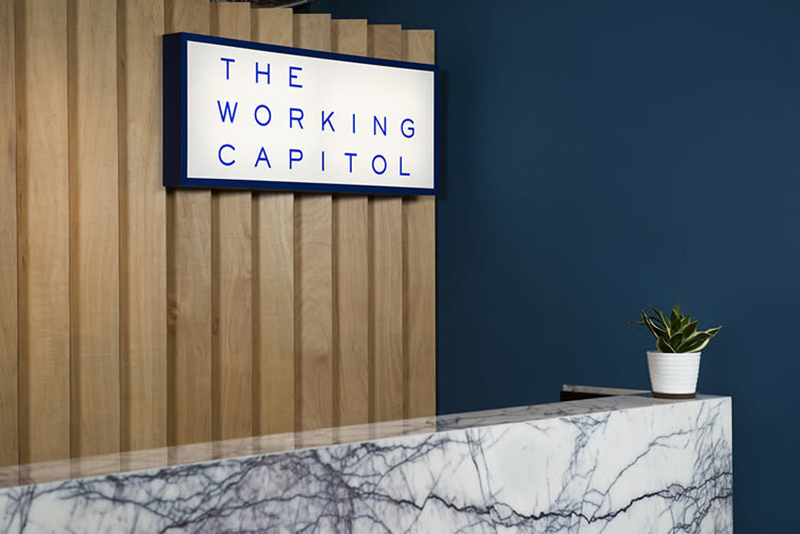 The Working Capitol in Singapore // The Working Capitol is a multifaceted coworking destination located in a central and exciting neighbourhood in Singapore, and home to a driven community of startups and businesses operating across the creative and tech industries. 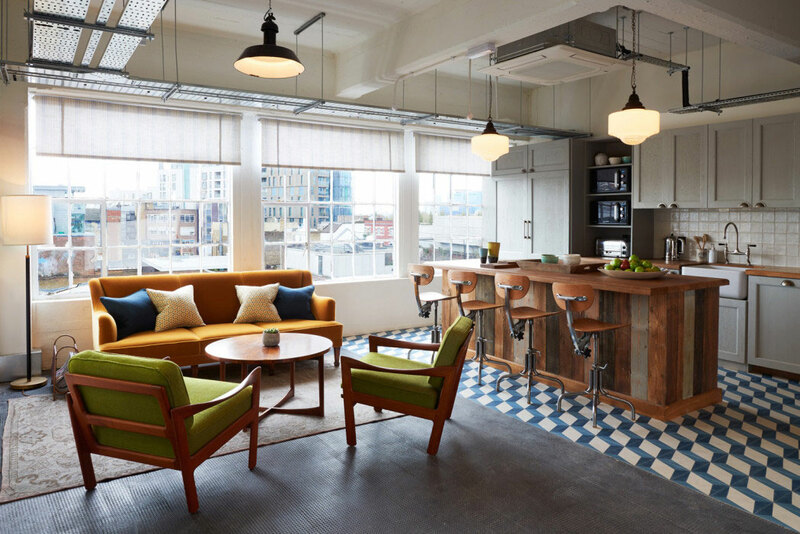 Members get 24/7 access to hot-desking areas, meeting rooms and events spaces, office services, a beer garden — there’s even showers, changing rooms and pantries for the true workaholics who can’t tear themselves away from their pressing projects. 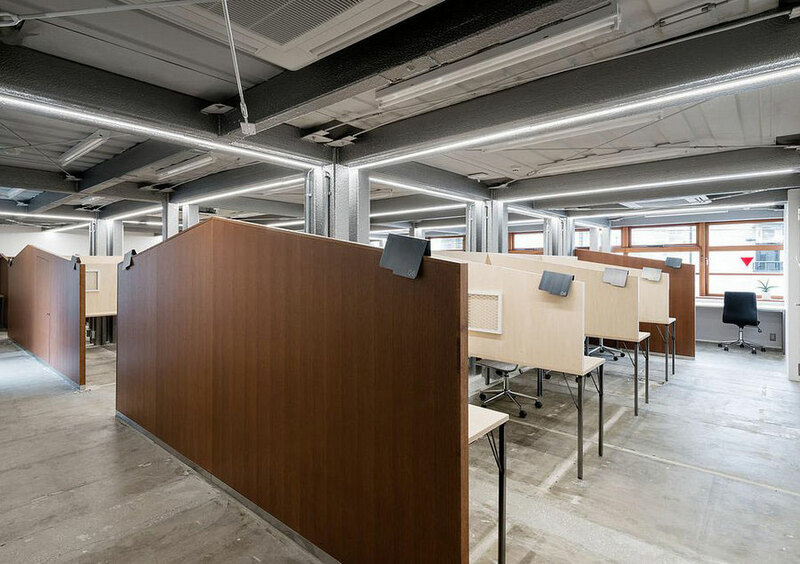 The building had previously been used as a biscuit factory and an office headquarters, and required a smart and substantial piece of remodelling from TWC’s interiors specialists Takenouchi Webb, augmented by the pin-sharp work of Foreign Policy Design Group. 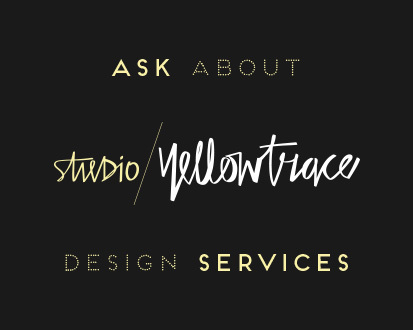 The branding firm’s way-finding work in particular stands out, not only as an invaluable measure against getting lost amid the multi-level, multifaceted facility, but as a major contributor to the project’s overall aesthetic appeal. Photography by Corneel de Wilde. 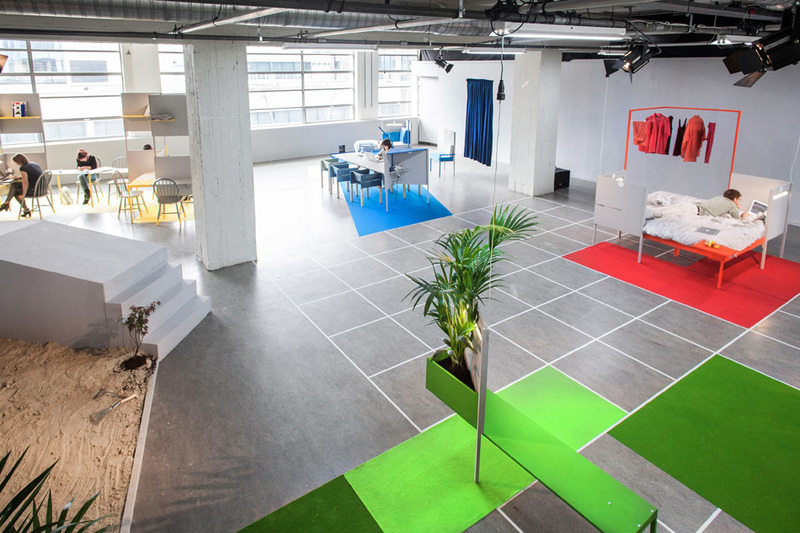 KNOL’s ‘Out of Office’ experiment on work environments // As commentary on the evolution of office environments, dutch design studio KNOL have conducted ‘out of office’, a spatial experiment which creates a flexible work setting that gradually transforms into a rigid grid of cubicles. 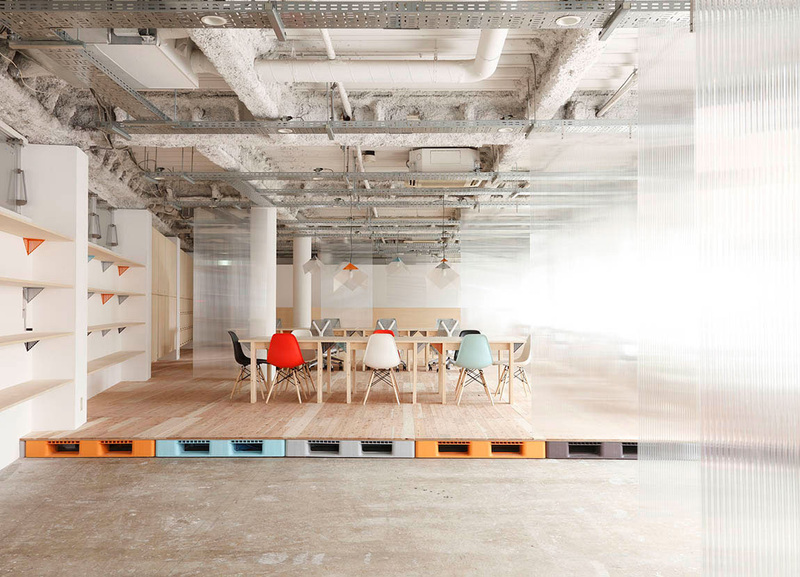 In a former warehouse building in the center of Eindhoven, a 300sqm room was arranged as a field of colourful work furnishings. The configuration embodies freedom and comfort, suiting the ethic of the 21st century. Related Post: Skinned by KNOL Ontwerp: Latex Casts of Buildings. Images courtesy of Itochu Fashion System. 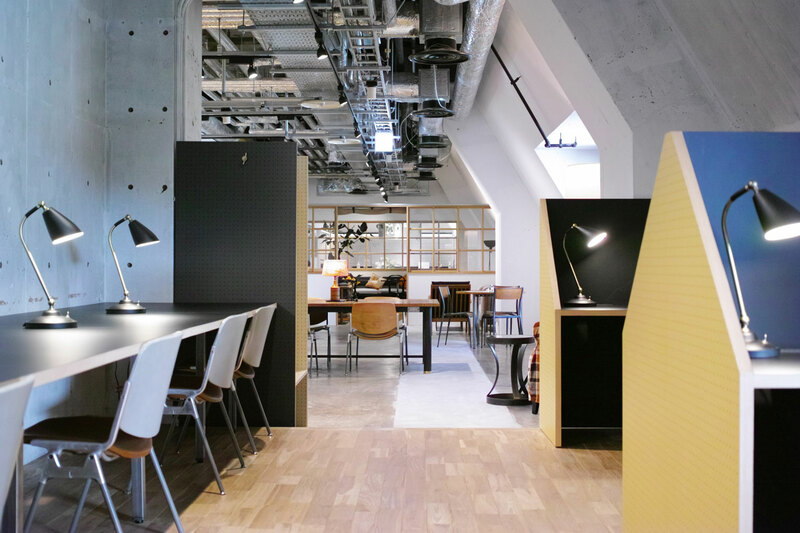 ‘WORK WORK SHOP’ Experimental Workplace in Tokyo // “Today is the future,” says the ifs future laboratory, an initiative started by itochu fashion system (ifs). 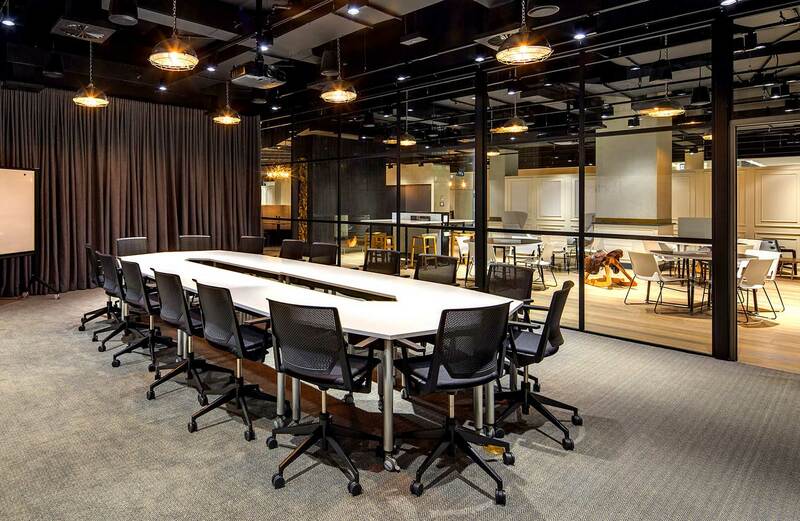 In 2014, they took another step towards by opening WORK WORK SHOP, a new collaborative workspace that is made available to brands and companies to conduct workshops, focus groups or simply interact with others. 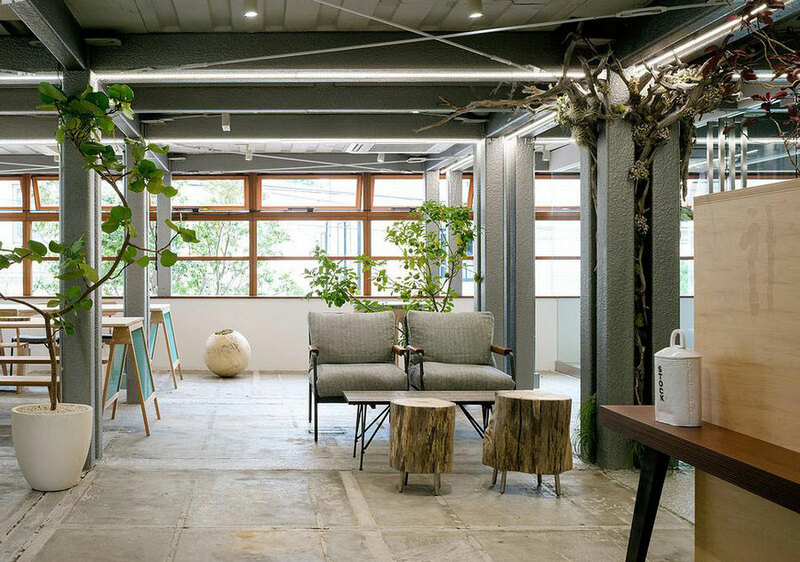 The space itself is fitted out with Kokuyo Furniture that has been customised and given a new facelift by architectural design duo Keiko + Manabu. 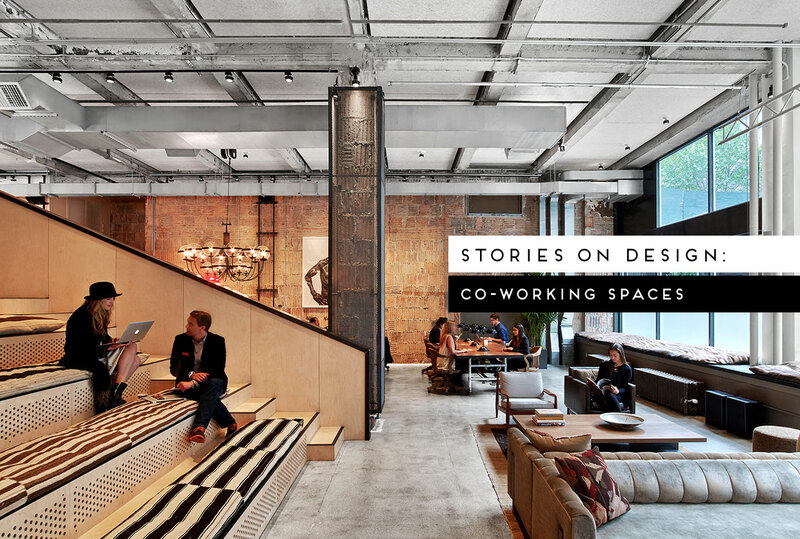 It’s just one of the many ways the space plans to bring companies and designers together who wouldn’t typically work with each other. 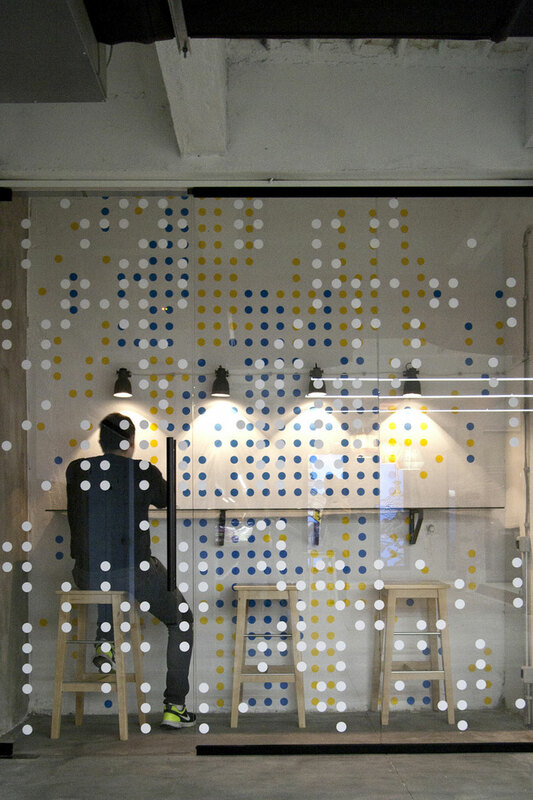 TECHTILE #3: NOSIGNER Wrap a Gallery Interior in Aluminium Foil.